Competition can constrain buyers and sellers to be price-takers. The interaction of supply and demand determines a market equilibrium in which both buyers and sellers are price-takers, called a competitive equilibrium. Prices and quantities in competitive equilibrium change in response to supply and demand shocks. Price-taking behaviour ensures that all gains from trade in the market are exhausted at a competitive equilibrium. The model of perfect competition describes idealized conditions under which all buyers and sellers are price-takers. Real-world markets are typically not perfectly competitive, but some policy problems can be analysed using this demand and supply model. There are important similarities and differences between price-taking and price-setting firms. Students of American history learn that the defeat of the southern Confederate states in the American Civil War ended slavery in the production of cotton and other crops in that region. There is also an economics lesson in this story. At the war’s outbreak on 12 April 1861, President Abraham Lincoln ordered the US Navy to blockade the ports of the Confederate states. These states had declared themselves independent of the US to preserve the institution of slavery. As a result of the naval blockade, the export of US-grown raw cotton to the textile mills of Lancashire in England came to a virtual halt, eliminating three-quarters of the supply of this critical raw material. Sailing at night, a few blockade-running ships evaded Lincoln’s patrols, but 1,500 were destroyed or captured. We will see in this unit that the market price of a good, such as cotton, is determined by the interaction of supply and demand. In the case of raw cotton, the tiny quantities reaching England through the blockade were a dramatic reduction in supply. There was large excess demand—that is to say, at the prevailing price, the quantity of raw cotton demanded exceeded the available supply. As a result, some sellers realized they could profit by raising the price. Eventually, cotton was sold at prices six times higher than before the war, keeping the lucky blockade-runners in business. Consumption of cotton fell to half the prewar level, throwing hundreds of thousands of people who worked in cotton mills out of work. Mill owners responded. For them, the price rise was an increase in their costs. Some firms failed and left the industry due to the reduction in their profits. Mill owners looked to India to find an alternative to US cotton, greatly increasing the demand for cotton there. The excess demand in the markets for Indian cotton gave some sellers an opportunity to profit by raising prices, resulting in increases in the prices of Indian cotton, which quickly rose almost to match the price of US cotton. There was a problem. The only source of cotton that could come close to making up the shortfall from the US was in India. But Indian cotton differed from American cotton, and required an entirely different kind of processing. Within months of the shift to Indian cotton, new machinery was developed to process it. The lesson for economists: Lincoln ordered the blockade, but in what followed, the farmers and sellers who increased the price of cotton were not responding to orders. Neither were the mill owners who cut back the output of textiles and laid off the mill workers, nor were the mill owners desperately searching for new sources of raw material. By ordering new machinery, the mill owners set off a boom in investment and new jobs. All of these decisions took place over a matter of months, by millions of people, most of whom were total strangers to one another, each seeking to make the best of a totally new economic situation. American cotton was now scarcer, and people responded, from the cotton fields of Maharashtra in India to the Nile delta, to Brazil, and the Lancashire mills. In planned economies, which operated in the Soviet Union and other central and eastern European countries before the 1990s (discussed in Unit 1), messages about how things would be produced are sent deliberately by government experts. They decide what will be produced and at what price it will be sold. The same is true, as we saw in Unit 6, inside large firms like General Motors, where managers (and not prices) determine who does what. In Unit 7 we considered the case of a good produced and sold by just one firm. There was one seller with many buyers in the market for that product. In this unit, we look at markets where many buyers and sellers interact, and show how the competitive market price is determined by both the preferences of consumers and the costs of suppliers. When there are many firms producing the same product, each firm’s decisions are affected by the behaviour of competing firms, as well as consumers. For a simple model of a market with many buyers and sellers, think about the potential for trade in second-hand copies of a recommended textbook for a university economics course. Demand for the book comes from students who are about to begin the course, and they will differ in their willingness to pay (WTP). No one will pay more than the price of a new copy in the campus bookshop. Below that, students’ WTP may depend on how hard they work, how important they think the book is, and on their available resources for buying books. Often when you buy something you don’t need to think about your exact willingness to pay. You just decide whether to pay the asking price. But WTP is a useful concept for buyers in online auctions, such as eBay. If you want to bid for an item, one way to do it is to set a maximum bid equal to your WTP, which will be kept secret from other bidders: this article explains how to do it on eBay. eBay will place bids automatically on your behalf until you are the highest bidder, or until your maximum is reached. You will win the auction if, and only if, the highest bid is less than or equal to your WTP. Figure 8.1 shows the demand curve. As in Unit 7, we line up all the consumers in order of willingness to pay, highest first. The first student is willing to pay $20, the 20th $10, and so on. For any price, P, the graph tells you how many students would be willing to buy: it is the number whose WTP is at or above P.
The market demand curve for books. Figure 8.1 The market demand curve for books. 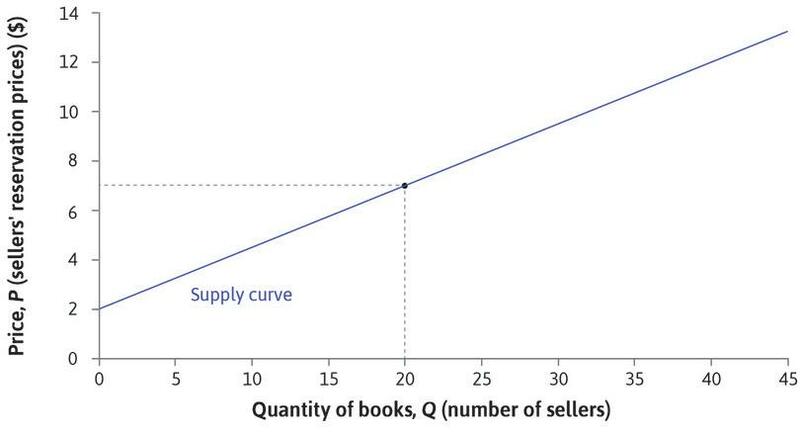 The demand curve represents the WTP of buyers; similarly, supply depends on the sellers’ willingness to accept (WTA) money in return for books. The supply of second-hand books comes from students who have previously completed the course, who will differ in the amount they are willing to accept—that is, their reservation price. Recall from Unit 5 that Angela was willing to enter into a contract with Bruno only if it gave her at least as much utility as her reservation option (no work and survival rations); here the reservation price of a potential seller represents the value to her of keeping the book, and she will only be willing to sell for a price at least that high. Poorer students (who are keen to sell so that they can afford other books) and those no longer studying economics may have lower reservation prices. Again, online auctions like eBay allow sellers to specify their WTA. If you sell an item on eBay you can set a reserve price, which will not be disclosed to the bidders. This article explains eBay reserve prices. You are telling eBay that the item should not be sold unless there is a bid at (or above) that price. So the reserve price should correspond to your WTA. If no one bids your WTA, the item will not be sold. We can draw a supply curve by lining up the sellers in order of their reservation prices (their WTAs): see Figure 8.2. We put the sellers who are most willing to sell—those who have the lowest reservation prices—first, so the graph of reservation prices slopes upward. The supply curve for books. Figure 8.2 The supply curve for books. The first seller has a reservation price of $2, and will sell at any price above that. Figure 8.2a The first seller has a reservation price of $2, and will sell at any price above that. … and the 40th seller’s reservation price is $12. Figure 8.2c … and the 40th seller’s reservation price is $12. If you choose a particular price, say $10, the graph shows how many books would be supplied (Q) at that price: in this case, it is 32. The supply curve slopes upward: the higher the price, the more students will be willing to sell. 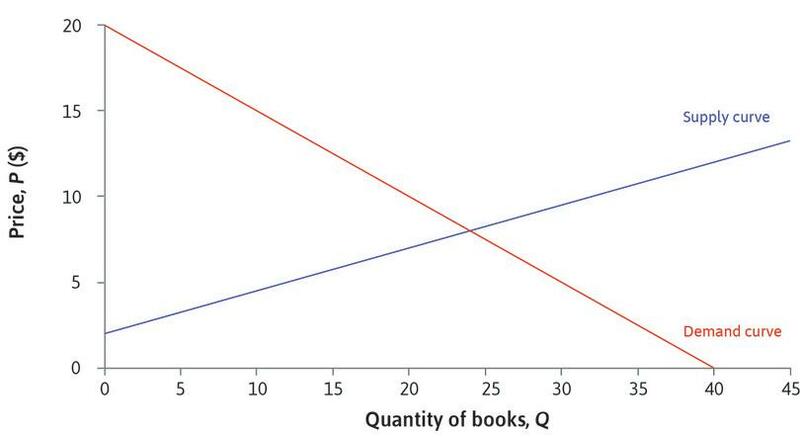 Figure 8.2d If you choose a particular price, say $10, the graph shows how many books would be supplied (Q) at that price: in this case, it is 32. The supply curve slopes upward: the higher the price, the more students will be willing to sell. For any price, the supply curve shows the number of students willing to sell at that price—that is, the number of books that will be supplied to the market. Notice that we have drawn the supply and demand curves as straight lines for simplicity. In practice they are more likely to be curves, with the exact shape depending on how valuations of the book vary among the students. As a student representative, one of your roles is to organize a second-hand textbook market between the current and former first-year students. After a survey, you estimate the demand and supply curves to be the ones shown in Figures 8.1 and 8.2. For example, you estimate that pricing the book at $7 would lead to a supply of 20 books and a demand of 26 books. Which of the following statements is correct? A rumour that the textbook may be required again in Year 2 would change the supply curve, shifting it upwards. Doubling the price to $14 would double the supply. A rumour that the textbook may no longer be on the reading list for the first-year students would change the demand curve, shifting it upwards. Demand would double if the price were reduced sufficiently. The rumour would make the former first-year students less willing to sell. Their WTAs would rise, shifting the supply curve upwards. Equivalently, the number of students willing to supply their book at each price would be lower. From the supply curve, we can see that supply would double to 40 if the price were increased to $12. The rumour would shift the demand curve downwards. The maximum demand attainable is 40 at zero price. Advertise it in the local newspaper. Take it to a car auction. Offer it to a second-hand car dealer. Would your reservation price be the same in each case? Why? If you used the first method, would you advertise it at your reservation price? Which method do you think would result in the highest sale price? What would you expect to happen in the market for this textbook? That will depend on the market institutions that bring buyers and sellers together. If students have to rely on word-of-mouth, then when a buyer finds a seller they can try to negotiate a deal that suits both of them. But each buyer would like to be able to find a seller with a low reservation price, and each seller would like to find a buyer with a high willingness to pay. Before concluding a deal with one trading partner, both parties would like to know about other trading opportunities. Traditional market institutions often brought many buyers and sellers together in one place. Many of the world’s great cities grew up around marketplaces and bazaars along ancient trading routes such as the Silk Road between China and the Mediterranean. In the Grand Bazaar of Istanbul, one of the largest and oldest covered markets in the world, shops selling carpets, gold, leather, and textiles cluster together in different areas. In medieval towns and cities it was common for makers and sellers of a specific type of good to set up shops close to each other, so customers knew where to find them. The city of London is now a financial centre, but evidence of trades once carried out there can be found in surviving street names: Pudding Lane, Bread Street, Milk Street, Threadneedle Street, Ropemaker Street, Poultry Street, and Silk Street. With modern communications, sellers can advertise their goods and buyers can more easily find out what is available, and where to buy it. But in some cases it is still convenient for many buyers and sellers to meet each other. Large cities have markets for meat, fish, vegetables or flowers, where buyers can inspect and compare the quality of the produce. In the past, markets for second-hand goods often involved specialist dealers, but nowadays sellers can contact buyers directly through online marketplaces such as eBay. Websites now help students sell textbooks to others in their university. 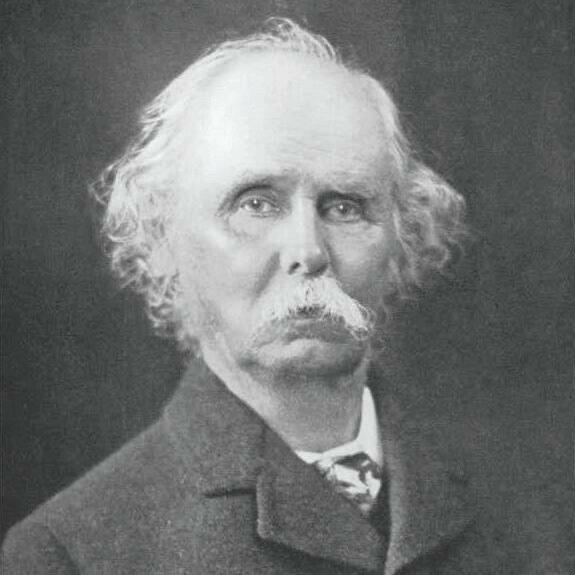 At the end of the nineteenth century, the economist Alfred Marshall introduced his model of supply and demand using a similar example to our case of second-hand books. Most English towns had a corn exchange (also known as a grain exchange)—a building where farmers met with merchants to sell their grain. Marshall described how the supply curve of grain would be determined by the prices that farmers would be willing to accept, and the demand curve by the willingness to pay of merchants. Then he argued that, although the price ‘may be tossed hither and thither like a shuttlecock’ in the ‘higgling and bargaining’ of the market, it would never be very far from the particular price at which the quantity demanded by merchants was equal to the quantity the farmers would supply. Marshall called the price that equated supply and demand the equilibrium price. If the price was above the equilibrium, farmers would want to sell large quantities of grain. But few merchants would want to buy—there would be excess supply. Then, even the merchants who were willing to pay that much would realize that farmers would soon have to lower their prices and would wait until they did. Similarly, if the price was below the equilibrium, sellers would prefer to wait rather than sell at that price. If, at the going price, the amount supplied did not equal the amount demanded, Marshall reasoned that some sellers or buyers could benefit by charging some other price (in modern terminology, we would say that the going price was not a Nash equilibrium). So the price would tend to settle at an equilibrium level, where demand and supply were equated. Marshall’s argument was based on the assumption that all the grain was of the same quality. His supply and demand model can be applied to markets in which all sellers are selling identical goods, so buyers are equally willing to buy from any seller. If the farmers all had grain of different qualities, they would be more like the sellers of differentiated products in Unit 7. Sadly, much of the wisdom in Marshall’s text has rarely been taught by his followers. Marshall paid attention to facts. His observation that large firms could produce at lower unit costs than small firms was integral to his thinking, but it never found a place in the neoclassical school. This may be because if the average cost curve is downward-sloping even when firms are very large, there will be a kind of winner-takes-all competition in which a few large firms emerge as winners with the power to set prices, rather than taking the going price as a given. We return to this problem in Unit 12 and Unit 21. Marshall was Professor of Political Economy at the University of Cambridge between 1885 and 1908. In 1896 he circulated a pamphlet to the University Senate objecting to a proposal to allow women to be granted degrees. Marshall prevailed and women would wait until 1948 before being granted academic standing at Cambridge on a par with men. Would Marshall now be satisfied with the contribution that modern economics has made to creating a more just economy? To apply the supply and demand model to the textbook market, we assume that all the books are identical (although in practice some may be in better condition than others) and that a potential seller can advertise a book for sale by announcing its price on a local website. As at the Corn Exchange, we would expect that most trades would occur at similar prices. Buyers and sellers can easily observe all the advertised prices, so if some books were advertised at $10 and others at $5, buyers would be queuing to pay $5, and these sellers would quickly realize that they could charge more, while no one would want to pay $10 so these sellers would have to lower their price. We can find the equilibrium price by drawing the supply and demand curves on one diagram, as in Figure 8.3. 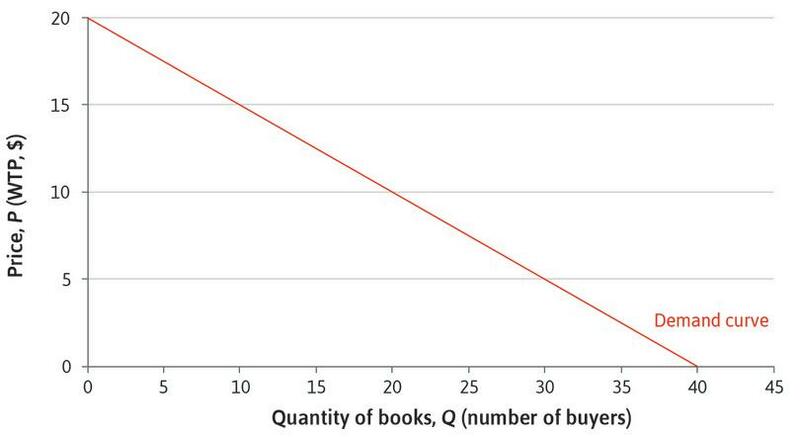 At a price P* = $8, the supply of books is equal to demand: 24 buyers are willing to pay $8, and 24 sellers are willing to sell. The equilibrium quantity is Q* = 24. Equilibrium in the market for second-hand books. Figure 8.3 Equilibrium in the market for second-hand books. We find the equilibrium by drawing the supply and demand curves in the same diagram. Figure 8.3a We find the equilibrium by drawing the supply and demand curves in the same diagram. At a price P* = $8, the quantity supplied is equal to the quantity demanded: Q* = 24. The market is in equilibrium. We say that the market clears at a price of $8. Figure 8.3b At a price P* = $8, the quantity supplied is equal to the quantity demanded: Q* = 24. The market is in equilibrium. We say that the market clears at a price of $8. At a price greater than $8 more students would wish to sell, but not all of them would find buyers. There would be excess supply, so these sellers would want to lower their price. Figure 8.3c At a price greater than $8 more students would wish to sell, but not all of them would find buyers. There would be excess supply, so these sellers would want to lower their price. At a price less than $8, there would be more buyers than sellers—excess demand—so sellers could raise their prices. Only at $8 is there no tendency for change. Figure 8.3d At a price less than $8, there would be more buyers than sellers—excess demand—so sellers could raise their prices. Only at $8 is there no tendency for change. The market-clearing price is $8—that is, supply is equal to demand at this price, so all buyers who want to buy and all sellers who want to sell can do so. The market is in equilibrium. In everyday language, something is in equilibrium if the forces acting on it are in balance, so that it remains still. Remember Fisher’s hydraulic model of price determination from Unit 2: changes in the economy caused water to flow through the apparatus until it reached an equilibrium, with no further tendency for prices to change. We say that a market is in equilibrium if the actions of buyers and sellers have no tendency to change the price or the quantities bought and sold, unless there is a change in market conditions such as the numbers of potential buyers and sellers, and how much they value the good. At the equilibrium price for textbooks, all those who wish to buy or sell are able to do so, so there is no tendency for change. Not all online markets for books are in competitive equilibrium. In one case when the conditions for equilibrium were not met, automatic price-setting algorithms raised the price of a book to $23 million! Michael Eisen, a biologist, noticed a classic but out-of-print text, The Making of a Fly, was listed for sale on Amazon by two reputable sellers, with prices starting at $1,730,045.91 (+$3.99 shipping). He watched over the next week as the prices rose rapidly, eventually peaking at $23,698,655.93, before dropping to $106.23. Eisen explains why in his blog. Will the market always be in equilibrium? As we have seen, Marshall argued that prices would not deviate far from the equilibrium level, because people would want to change their prices if there were excess supply or demand. In this unit, we study competitive market equilibria. In Unit 11 we will look at when and how prices change when the market is not in equilibrium. In the textbook market that we have described, individual students have to accept the prevailing equilibrium price in the market, determined by the supply and demand curves. No one would trade with a student asking a higher price or offering a lower one, because anyone could find an alternative seller or buyer with a better price. The participants in this market are price-takers, because there is sufficient competition from other buyers and sellers so the best they can do is to trade at the same price. Any buyer or seller is of course free to choose a different price, but they cannot benefit by doing so. We have seen examples where market participants do not behave as price-takers: the producer of a differentiated product can set its own price because it has no close competitors. Notice, however, that although the sellers of differentiated products are price-setters, the buyers in Unit 7 were price-takers. Since there are so many consumers wanting to buy breakfast cereals, an individual consumer has no power to negotiate a more advantageous deal, but simply has to accept the price that all other consumers are paying. In this unit, we study market equilibria where both buyers and sellers are price-takers. We expect to see price-taking on both sides of the market where there are many sellers selling the identical goods, and many buyers wishing to purchase them. Sellers are forced to be price-takers by the presence of other sellers, as well as buyers who always choose the seller with the lowest price. If a seller tried to set a higher price, buyers would simply go elsewhere. Similarly buyers are price-takers when there are plenty of other buyers, and sellers willing to sell to whoever will pay the highest price. On both sides of the market, competition eliminates bargaining power. We will describe the equilibrium in such a market as a competitive equilibrium. A competitive market equilibrium is a Nash equilibrium, because given what all other actors are doing (trading at the equilibrium price), no actor can do better than to continue what he or she is doing (also trading at the equilibrium price). Think about some of the goods you buy: perhaps different kinds of food, clothes, transport tickets, or electronic goods. Are there many sellers of these goods? Do you try to find the lowest price in each case? For which goods would price be your main criterion? Use your answers to help you decide whether the sellers of these goods are price-takers. Are there goods for which you, as a buyer, are not a price-taker? The diagram shows the demand and the supply curves for a textbook. The curves intersect at (Q, P) = (24, 8). Which of the following is correct? At price $10, there is an excess demand for the textbook. At $8, some of the sellers have an incentive to increase their selling price to $9. At $8, the market clears. 40 books will be sold in total. At $10 the price is above the equilibrium price of $8, and there is an excess supply of books. At $8, all buyers with a WTP at $8 or above can be matched with all sellers with a WTA of $8 or less. If one of these sellers raised their price to $9, the buyer could find another seller willing to accept less. At $8, the quantity demanded is equal to the quantity supplied—that is, the market clears. The maximum level of demand is 40, but 16 of these will be unfulfilled as their willingness-to-pay is below the market clearing price of $8. In the second-hand textbook example, both buyers and sellers are individual consumers. Now we look at markets where the sellers are firms. We know from Unit 7 how firms choose their price and quantity when producing differentiated goods, and we saw that if other firms made similar products, their choice of price would be restricted (the demand curve for their own product would be almost flat) because raising the price would cause consumers to switch to other similar brands. If there are many firms producing identical products, and consumers can easily switch from one firm to another, then firms will be price-takers in equilibrium. They will be unable to benefit from attempting to trade at a price different from the prevailing price. To see how price-taking firms behave, consider a city where many small bakeries produce bread and sell it direct to consumers. Figure 8.4 shows what the market demand curve (the total daily demand for bread of all consumers in the city) might look like. It is downward-sloping as usual because at higher prices, fewer consumers will be willing to buy. The market demand curve for bread. 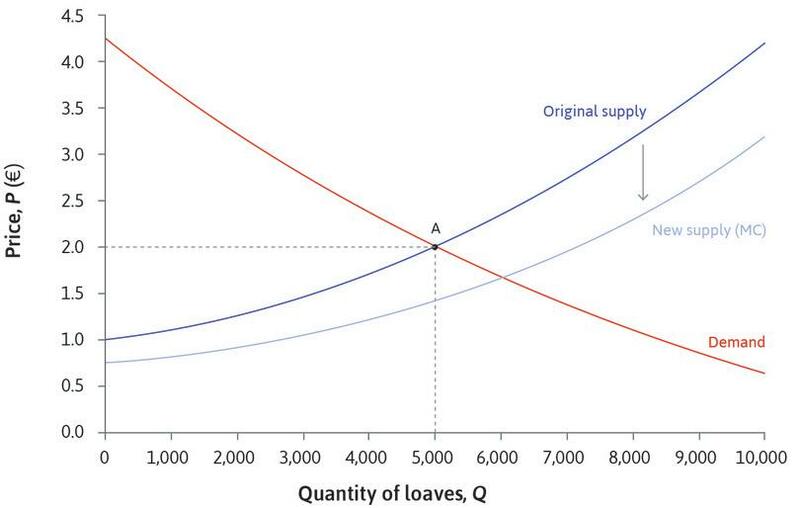 Figure 8.4 The market demand curve for bread. Suppose that you are the owner of one small bakery. You have to decide what price to charge and how many loaves to produce each morning. Suppose that neighbouring bakeries are selling loaves identical to yours at €2.35. This is the prevailing market price, and you will not be able to sell loaves at a higher price than other bakeries, because no one would buy—you are a price-taker. Your marginal costs increase with your output of bread. When the quantity is small, the marginal cost is low, close to €1: having installed mixers, ovens and other equipment, and employed a baker, the additional cost to produce a loaf of bread is relatively small, but the average cost of a loaf is high. As the number of loaves per day increases, the average cost falls, but marginal costs begin to rise gradually because you have to employ extra staff and use equipment more intensively. At higher quantities the marginal cost is above the average cost; then average costs rise again. The marginal and average cost curves are drawn in Figure 8.5. As in Unit 7, costs include the opportunity cost of capital. If price were equal to average cost (P = AC), your economic profit would be zero. You, the owner, would obtain a normal return on your capital. So the average cost curve (the leftmost curve in Figure 8.5) is the zero-economic-profit curve. The isoprofit curves show price and quantity combinations at which you would receive higher levels of profit. As we explained in Unit 7, isoprofit curves slope downwards where price is above marginal cost, and upwards where price is below marginal cost, so the marginal cost curve passes through the lowest point on each isoprofit curve. If price is above marginal cost, total profits can remain unchanged only if a larger quantity is sold for a lower price. Similarly, if price is below marginal cost, total profits can remain unchanged only if a larger quantity is sold for a higher price. Figure 8.5 demonstrates how to make your decision. Like the firms in Unit 7, you face a constrained optimization problem. You want to find the point of maximum profit in your feasible set. The profit-maximizing price and quantity for a bakery. Figure 8.5 The profit-maximizing price and quantity for a bakery. The bakery has an increasing MC curve. On the AC curve, profit is zero. When MC > AC, the AC curve slopes upward. The other isoprofit curves represent higher levels of profit, and MC passes through the lowest points of all the isoprofit curves. Figure 8.5a The bakery has an increasing MC curve. On the AC curve, profit is zero. When MC > AC, the AC curve slopes upward. The other isoprofit curves represent higher levels of profit, and MC passes through the lowest points of all the isoprofit curves. The bakery is a price-taker. The market price is P* = €2.35. If you choose a higher price, customers will go to other bakeries. Your feasible set of prices and quantities is the area below the horizontal line at P*. Figure 8.5b The bakery is a price-taker. The market price is P* = €2.35. If you choose a higher price, customers will go to other bakeries. Your feasible set of prices and quantities is the area below the horizontal line at P*. The point of highest profit in the feasible set is point A, where the €80 isoprofit curve is tangent to the feasible set. You should make 120 loaves per day, and sell them at the market price, €2.35 each. You will make €80 of profit per day in addition to normal profits. Figure 8.5c The point of highest profit in the feasible set is point A, where the €80 isoprofit curve is tangent to the feasible set. You should make 120 loaves per day, and sell them at the market price, €2.35 each. You will make €80 of profit per day in addition to normal profits. 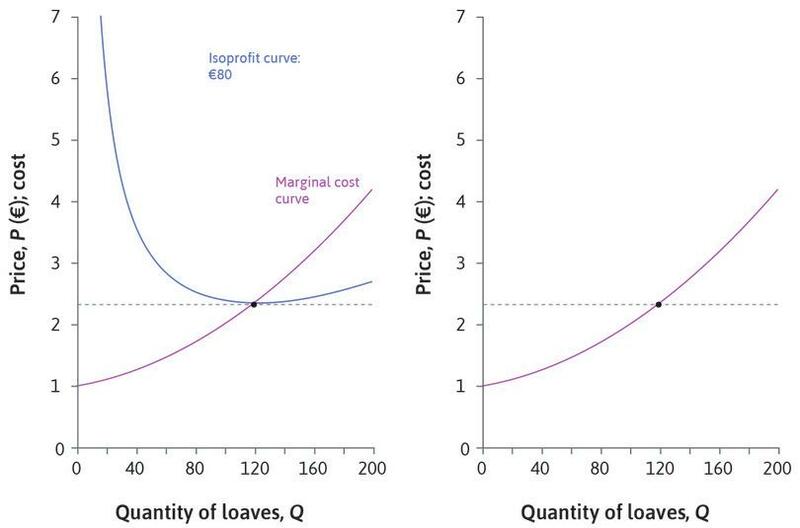 Your profit-maximizing quantity, Q* = 120, is found at the point where P* = MC: the marginal cost of the 120th loaf is equal to the market price. 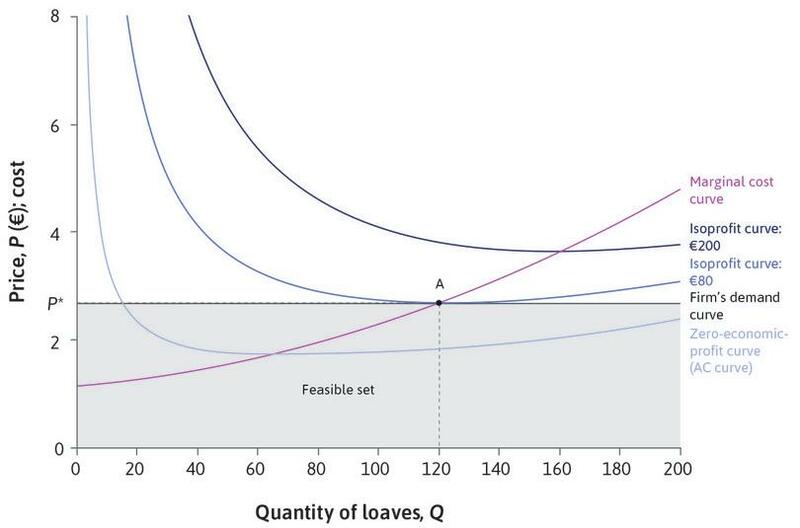 Figure 8.5d Your profit-maximizing quantity, Q* = 120, is found at the point where P* = MC: the marginal cost of the 120th loaf is equal to the market price. Because you are a price-taker, the feasible set is all points where price is less than or equal to €2.35, the market price. Your optimal choice is P* = €2.35 and Q* = 120, where the isoprofit curve is tangent to the feasible set. The problem looks similar to the one for Beautiful Cars in Unit 7, except that for a price-taker, the demand curve is completely flat. For your bakery, it is not the market demand curve in Figure 8.4 that affects your own demand, it is the price charged by your competitors. This is why the horizontal line at P* in Figure 8.5 is labelled as the firm’s demand curve. If you charge more than P*, your demand will be zero, but at P* or less you can sell as many loaves as you like. 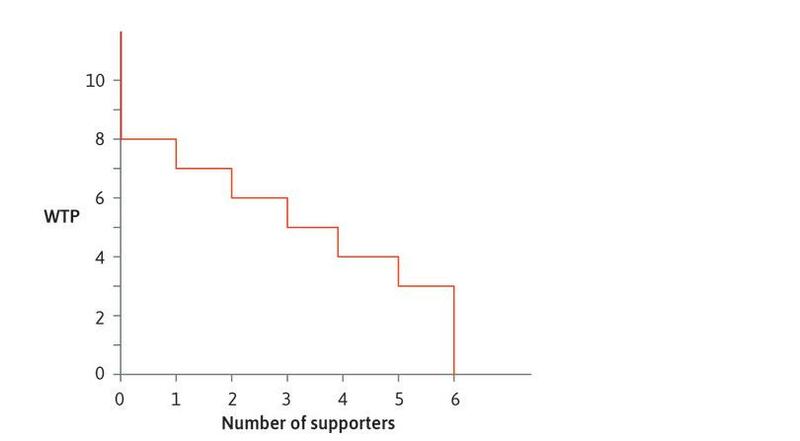 Figure 8.5 illustrates a very important characteristic of price-taking firms. They choose to produce a quantity at which the marginal cost is equal to the market price (MC = P*). This is always true. For a price-taking firm, the demand curve for its own output is a horizontal line at the market price, so maximum profit is achieved at a point on the demand curve where the isoprofit curve is horizontal. And we know from Unit 7 that where isoprofit curves are horizontal, the price is equal to the marginal cost. Another way to understand why a price-taking firm produces at the level of output where MC = P* is to think about what would happen to its profits if it deviated from this point. If the firm were to increase output to a level where MC > P*, the last unit would cost more than P* to make, so the firm would make a loss on this unit and could make higher profits by reducing output. If it were to produce where MC < P*, it could produce at least one more unit and sell it at a profit. Therefore it should raise output as far as the point where MC = P*. This is where profits are maximized. A price-taking firm maximizes profit by choosing a quantity where the marginal cost is equal to the market price (MC = P*) and selling at the market price P*. This is an important result that you should remember, but you need to be careful with it. When we make statements like ‘for a price-taking firm, price equals marginal cost’, we do not mean that the firm chooses a price equal to its marginal cost. Instead, we mean the opposite: the firm accepts the market price, and chooses its quantity so that the marginal cost is equal to that price. Put yourself in the position of the bakery owner again. What would you do if the market price changed? Figure 8.6 demonstrates that as prices change you would choose different points on the marginal cost curve. Figure 8.6 The firm’s supply curve. When the market price is €2.35, you supply 120 loaves. What would you do if the price changed? Figure 8.6a When the market price is €2.35, you supply 120 loaves. What would you do if the price changed? If P* were to rise to €3.20, you could reach a higher isoprofit curve. To maximize profit you should produce 163 loaves per day. Figure 8.6b If P* were to rise to €3.20, you could reach a higher isoprofit curve. To maximize profit you should produce 163 loaves per day. If the price falls to €1.52 you could reach only the lightest blue curve. Your best choice would be 66 loaves, and your economic profit would be zero. Figure 8.6c If the price falls to €1.52 you could reach only the lightest blue curve. Your best choice would be 66 loaves, and your economic profit would be zero. In each case, you choose the point on your marginal cost curve where MC = market price. Your marginal cost curve is your supply curve. Figure 8.6d In each case, you choose the point on your marginal cost curve where MC = market price. Your marginal cost curve is your supply curve. For a price-taking firm, the marginal cost curve is the supply curve: for each price it shows the profit-maximizing quantity—that is, the quantity that the firm will choose to supply. If you expect market conditions to remain bad, it might be best to sell up and leave the market—you could obtain a better return on your capital elsewhere. If you expect the price to rise soon, you might be willing to incur some short-term losses, and it might be worth continuing to produce bread if the revenue helped you to cover the costs of maintaining your premises and retaining staff. 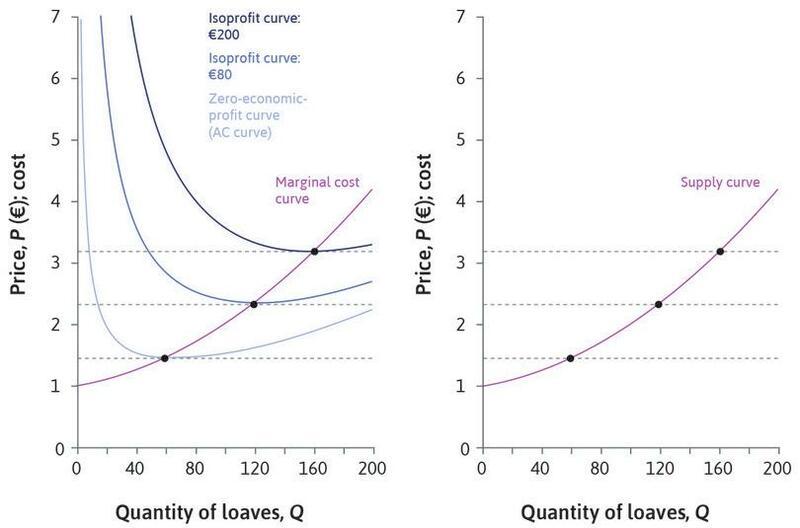 Figure 8.5 shows a price-taking bakery’s marginal and average cost curves, and its isoprofit curves. The market price for bread is P*= €2.35. Which of the following statements is correct? The firm’s supply curve is horizontal. At the market price of €2.35, the firm will supply 62 loaves, at the point where the firm makes zero profit. At any market price, the firm’s supply is given by the corresponding point on the average cost curve. The marginal cost curve is the firm’s supply curve. The firm’s demand curve is horizontal. Its supply curve is upward sloping. At €2.35 the firm maximizes profit at point A, where it supplies 120 loaves. At each price, the firm will choose a point on the highest isoprofit curve attainable, which will be a point on the marginal cost curve. At each price, the firm maximizes profit by choosing the corresponding quantity on the marginal cost curve. So the marginal cost curve is its supply curve. The market for bread in the city has many consumers and many bakeries. Let’s suppose there are 50 bakeries. Each one has a supply curve corresponding to its own marginal cost curve, so we know how much it will supply at any given market price. To find the market supply curve, we just add up the total amount that all the bakeries will supply at each price. Figure 8.7 shows how this works if all the bakeries have the same cost functions. We work out how much one bakery would supply at a given price, then multiply by 50 to find total market supply at that price. Figure 8.7 The firm and market supply curves. There are 50 bakeries, all with the same cost functions. If the market price is €2.35, each bakery will produce 120 loaves. Figure 8.7a There are 50 bakeries, all with the same cost functions. If the market price is €2.35, each bakery will produce 120 loaves. When P = €2.35, each bakery supplies 120 loaves, and the market supply is 50 × 120 = 6,000 loaves. 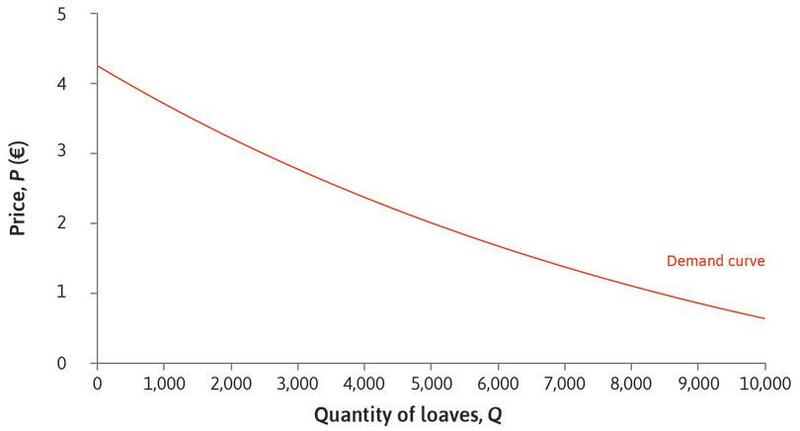 Figure 8.7b When P = €2.35, each bakery supplies 120 loaves, and the market supply is 50 × 120 = 6,000 loaves. At a price of €1.52 they each supply 66 loaves, and market supply is 3,300. The market supply curve looks like the firm’s supply curve, but the scale on the horizontal axis is different. Figure 8.7c At a price of €1.52 they each supply 66 loaves, and market supply is 3,300. The market supply curve looks like the firm’s supply curve, but the scale on the horizontal axis is different. What if different firms had different costs? If the bakeries had different cost functions, then at a price of €2.35 some bakeries would produce more loaves than others, but we could still add them together to find market supply. Figure 8.7d If the bakeries had different cost functions, then at a price of €2.35 some bakeries would produce more loaves than others, but we could still add them together to find market supply. 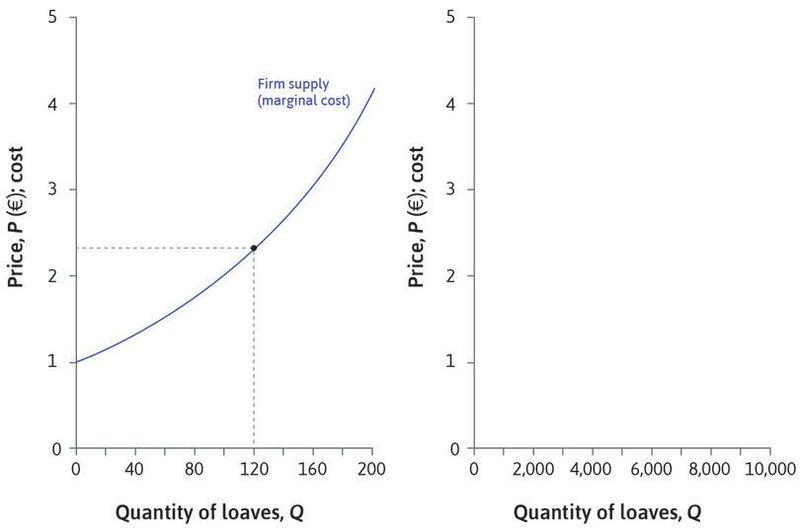 The market supply curve shows the total quantity that all the bakeries together would produce at any given price. It also represents the marginal cost of producing a loaf, just as the firm’s supply curve does. For example, if the market price is €2.75, total market supply is 7,000. For every bakery, the marginal cost—the cost of producing one more loaf—is €2.75. And that means that the cost of producing the 7,001st loaf in the market is €2.75, whichever firm produces it. So the market supply curve is the market’s marginal cost curve. Now we know both the demand curve (Figure 8.4) and the supply curve (Figure 8.7) for the bread market as a whole. Figure 8.8 shows that the equi­librium price is exactly €2.00. At this price, the market clears: consumers demand 5,000 loaves per day, and firms supply 5,000 loaves per day. Figure 8.8 Equilibrium in the market for bread. In the market equilibrium, each bakery is producing on its marginal cost curve, at the point where its marginal cost is €2.00. If you look back to the isoprofit curves in Figure 8.6, you will see that the firm is above its average cost curve, the isoprofit curve where economic profits are zero. So the owners of the bakeries are receiving economic rents (profit in excess of normal profit). Whenever there are economic rents, there is an opportunity for someone to benefit by taking an action. In this case, we might expect the economic rents to attract other bakeries into the market. We will see presently how this would affect the market equilibrium. Type A is more efficient than Type B: for example, as shown, at the output of 20 units, the Type A firms have a marginal cost of $2, as opposed to a marginal cost of $3 for the Type B firms. There are 10 Type A firms and 8 Type B firms in the market. Which of the following statements is correct? At price $2, the market supply is 450 units. The market will supply 510 units at price $3. At price $2, the market’s marginal cost of supplying one extra unit of the good will depend on the type of the firm that produces it. With different types of firms, we cannot determine the marginal cost curve for the market. At $2, type A firms supply 20 units and type B firms supply 15 units. So the market supply is (10 × 20) + (8 × 15) = 320. At $3, type A firms supply 35 units and type B firms supply 20 units. So the market supply is (10 × 35) + (8 × 20) = 510. Both types will be producing at the marginal cost of $2. Therefore the market marginal cost is $2, irrespective of which firm produces the extra unit. The market’s marginal cost curve is its supply curve. We can calculate supply at each price as in (a) and (b). Buyers and sellers of bread voluntarily engage in trade because both benefit. Their mutual benefits from the equilibrium allocation can be measured by the consumer and producer surpluses introduced in Unit 7. Any buyer whose willingness to pay for a good is higher than the market price receives a surplus: the difference between the WTP and the price paid. Similarly, if the marginal cost of producing a good is below the market price, the producer receives a surplus. 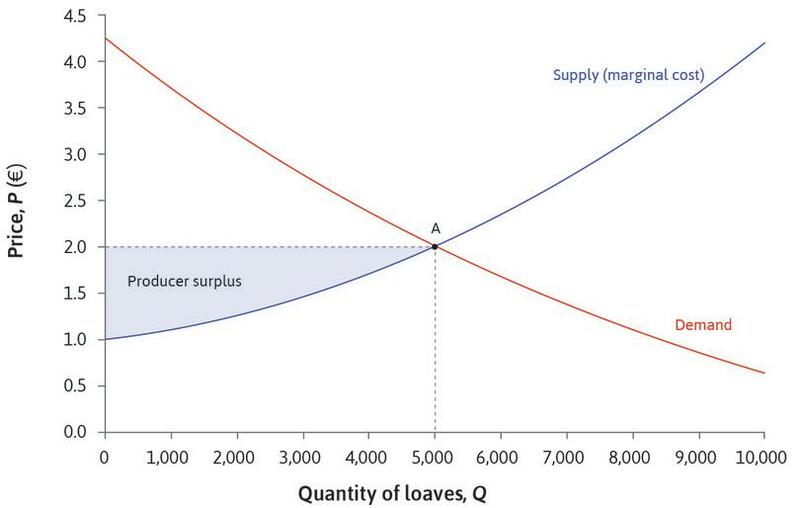 Figure 8.9a shows how to calculate the total surplus (the gains from trade) at the competitive equilibrium in the market for bread, in the same way as we did for the markets in Unit 7. Figure 8.9a Equilibrium in the bread market: Gains from trade. At the equilibrium price of €2 in the bread market, a consumer who is willing to pay €3.50 obtains a surplus of €1.50. Figure 8.9a-a At the equilibrium price of €2 in the bread market, a consumer who is willing to pay €3.50 obtains a surplus of €1.50. The shaded area above €2 shows total consumer surplus—the sum of all the buyers’ gains from trade. Figure 8.9a-b The shaded area above €2 shows total consumer surplus—the sum of all the buyers’ gains from trade. Remember from Unit 7 that the producer’s surplus on a unit of output is the difference between the price at which it is sold, and the marginal cost of producing it. The marginal cost of the 2,000th loaf is €1.25; since it is sold for €2, the producer obtains a surplus of €0.75. Figure 8.9a-c Remember from Unit 7 that the producer’s surplus on a unit of output is the difference between the price at which it is sold, and the marginal cost of producing it. The marginal cost of the 2,000th loaf is €1.25; since it is sold for €2, the producer obtains a surplus of €0.75. The shaded area below €2 is the sum of the bakeries’ surpluses on every loaf that they produce. The whole shaded area shows the sum of all gains from trade in this market, known as the total surplus. Figure 8.9a-d The shaded area below €2 is the sum of the bakeries’ surpluses on every loaf that they produce. The whole shaded area shows the sum of all gains from trade in this market, known as the total surplus. 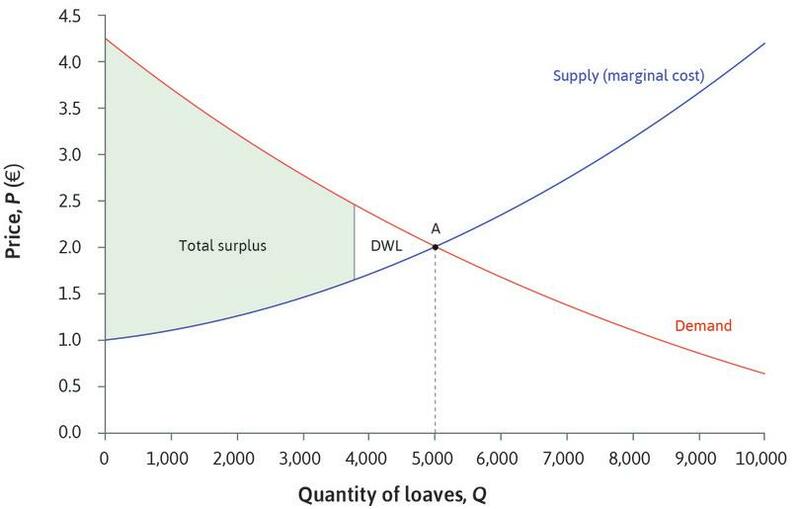 When the market for bread is in equilibrium with the quantity of loaves supplied equal to the quantity demanded, the total surplus is the area below the demand curve and above the supply curve. Notice how the equilibrium allocation in this market differs from the allocation of a differentiated product, Beautiful Cars, in Unit 7. The equilibrium quantity of bread is at the point where the market supply curve, which is also the marginal cost curve, crosses the demand curve, and the total surplus is the whole of the area between the two curves. Figure 7.13 showed that in the market for Beautiful Cars, the manufacturer chooses to produce a quantity below the point where the marginal cost curve meets the demand curve, and the total surplus is lower than it would be at that point. The competitive equilibrium allocation of bread has the property that the total surplus is maximized. Figure 8.9b shows that the surplus would be smaller if fewer than 5,000 loaves were produced. There would be consumers without bread who would be willing to pay more than the cost of producing another loaf, so there would be unexploited gains from trade. The total gains from trade in the market would be lower. We say there would be a deadweight loss equal to the triangle-shaped area. Producers would be missing out on potential profits, and some consumers would be unable to obtain the bread they were willing to pay for. And if more than 5,000 loaves were produced, the surplus on the extra loaves would be negative: they would cost more to make than consumers were willing to pay. At the equilibrium, all the potential gains from trade are exploited, which means there is no deadweight loss. This property—that the combined consumer and producer surplus is maximized at the point where supply equals demand—holds in general: if both buyers and sellers are price-takers, the equilibrium allocation maximizes the sum of the gains achieved by trading in the market, relative to the original allocation. We demonstrate this result in our Einstein at the end of this section. At the competitive equilibrium allocation in the bread market, it is not possible to make any of the consumers or firms better off (that is, to increase the surplus of any individual) without making at least one of them worse off. Provided that what happens in this market does not affect anyone other than the participating buyers and sellers, we can say that the equilibrium allocation is Pareto efficient. Pareto efficiency follows from three assumptions we have made about the bread market. The participants are price-takers. They have no market power. When a particular buyer trades with a particular seller, each of them knows that the other can find an alternative trading partner willing to trade at the market price. Sellers can’t raise the price because of competition from other sellers, and competition from other buyers prevents buyers from lowering it. Hence the suppliers will choose their output so that the marginal cost (the cost of the last unit produced) is equal to the market price. In contrast, the producer of a differentiated good has bargaining power because it faces less competition: no one else produces an identical good. The firm uses its power to keep the price high, raising its own share of the surplus but lowering total surplus. The price is above marginal cost, so the allocation is Pareto inefficient. The exchange of a loaf of bread for money is governed by a complete contract between buyer and seller. If you find there is no loaf of bread in the bag marked ‘bread’ when you get home, you can get your money back. Compare this with the incomplete employment contract in Unit 6, in which the firm can buy the worker’s time, but cannot be sure how much effort the worker will put in. We will see in Unit 9 that this leads to a Pareto-inefficient allocation in the labour market. We have implicitly assumed that what happens in this market affects no one except the buyers and sellers. To assess Pareto efficiency, we need to consider everyone affected by the allocation. If, for example, the early morning activities of bakeries disrupt the sleep of local residents, then there are additional costs of bread production and we ought to take the costs to the bakeries’ neighbours into account too. Then, we may conclude that the equilibrium allocation is not Pareto efficient after all. We will investigate this type of problem in Unit 12. Remember from Unit 5 that there are two criteria for assessing an allocation: efficiency and fairness. Even if we think that the market allocation is Pareto efficient, we should not conclude that it is necessarily a desirable one. What can we say about fairness in the case of the bread market? We could examine the distribution of the gains from trade between producers and consumers: Figure 8.9a showed that both consumers and firms obtain a surplus, and in this example consumer surplus is slightly higher than producer surplus. You can see that this happens because the demand curve is relatively steep compared with the supply curve. Recall also from Unit 7 that a steep demand curve corresponds to a low elasticity of demand. Similarly, the slope of the supply curve corresponds to the elasticity of supply: in Figure 8.9a, demand is less elastic than supply. In general, the distribution of the total surplus between consumers and producers depends on the relative elasticities of demand and supply. We might also want to take into account the market participants’ standard of living. For example, if a poor student buys a book from a rich student, we might think that an outcome in which the buyer paid less than the market price (closer to the seller’s reservation price) would be better, because it would be fairer. Or, if the consumers in the bread market were exceptionally poor, we might decide that it would be better to pass a law setting a maximum bread price lower than €2.00 to achieve a fairer (although Pareto-inefficient) outcome.5 In Unit 11, we will look at the effect of regulating markets in this way. The allocation may not be Pareto efficient: We might not have taken everything into account. There are other important considerations: Fairness, for example. Price-takers are hard to find in real life: It is not as easy as you might think to find behaviour consistent with our simple model of the bread market (as we will see in Section 8.9). Consider a market for the tickets to a football match. Six supporters of the Blue team would like to buy tickets; their valuations of a ticket (their WTP) are 8, 7, 6, 5, 4, and 3. The diagram below shows the demand ‘curve’. Six supporters of the Red team already have tickets, for which their reservation prices (WTA) are 2, 3, 4, 5, 6, and 7. Draw the supply and demand ‘curves’ on a single diagram (Hint: the supply curve is also a step function, like the demand curve). Show that four trades take place in equilibrium. Calculate the consumer (buyer) surplus by adding up the surpluses of the four buyers who trade. Similarly calculate the producer (or seller) surplus. Hence, find the total surplus in equilibrium. In this case, work out the surplus from each trade. How does the total surplus in this case compare with the equilibrium surplus? Starting from the allocation of tickets you obtained through bargaining, in which at least five tickets are owned by Blue supporters, is there a way through further trade to make one of the supporters better off without making anyone worse off? Sketch a diagram to illustrate the competitive market for bread, showing the equilibrium where 5,000 loaves are sold at a price of €2.00. Suppose that the bakeries get together to form a cartel. They agree to raise the price to €2.70, and jointly cut production to supply the number of loaves that consumers demand at that price. Shade the areas on your diagram to show the consumer surplus, producer surplus, and deadweight loss caused by the cartel. For what kinds of goods would you expect the supply curve to be highly elastic? Draw diagrams to illustrate how the share of the gains from trade obtained by producers depends on the elasticity of the supply curve. In Figure 8.9a, the market equilibrium output and price of the bread market is shown to be at (Q*, P*) = (5,000, €2). Suppose that the mayor decrees that bakeries must sell as much bread as consumers want, at a price of €1.50. Which of the following statements are correct? The consumer and producer surpluses both increase. The producer surplus increases but the consumer surplus decreases. The consumer surplus increases but the producer surplus decreases. The total surplus is lower than at the market equilibrium. Producer surplus is lower, because the price is below marginal cost. Consumer surplus is higher, because the price of the first 5,000 loaves is lower, and for the additional loaves it is below the consumers’ WTP. The consumers benefit from the lower price, but producers lose because the price is below marginal cost. There is a deadweight loss, equal to the area of the triangle between the supply and demand curves to the right of equilibrium. Which of the following statements about a competitive equilibrium allocation are correct? It is the best possible allocation. No buyer’s or seller’s surplus can be increased without reducing someone else’s surplus. The allocation must be Pareto efficient. The total surplus from trade is maximized. The allocation maximizes the total surplus, but the does not mean it is best for everyone in the market—for example, we may think it is unfair. This must be true, since the allocation maximizes the total surplus. The equilibrium allocation may not be Pareto efficient if it affects someone other than the buyers or sellers. This is a general property of competitive equilibrium. When buyers and sellers are price-takers, and the price equalizes supply and demand, the total surplus is as high as possible, because the consumers with the highest WTPs buy the product and the units of output with the lowest marginal costs are sold. Every trade involves a buyer with a higher WTP than the seller’s reservation value, so the surplus would go down if we omitted any of them. And if we tried to include any more units of output in this calculation, the surplus would also go down because the WTPs would be lower than the MCs. Quinoa is a cereal crop grown on the Altiplano, a high barren plateau in the Andes of South America. It is a traditional staple food in Peru and Bolivia. In recent years, as its nutritional properties have become known, there has been a huge increase in demand from richer, health-conscious consumers in Europe and North America. Figures 8.10a–c show how the market changed. You can see in Figures 8.10a and 8.10b that between 2001 and 2011, the price of quinoa trebled and production almost doubled. Figure 8.10c indicates the strength of the increase in demand: spending on imports of quinoa rose from just $2.4 million to $43.7 million in 10 years. Figure 8.10a The production of quinoa. Jose Daniel Reyes and Julia Oliver. ‘Quinoa: The Little Cereal That Could’. The Trade Post. 22 November 2013. 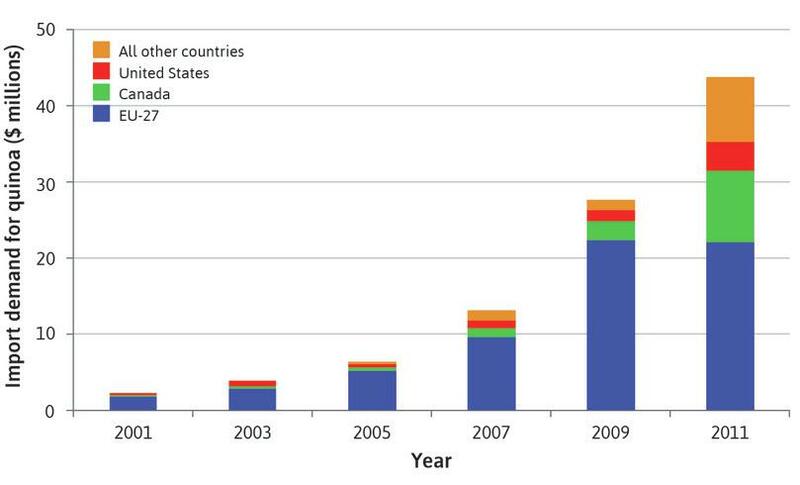 Underlying data from Food and Agriculture Organization of the United Nations. FAOSTAT Database. For the producer countries these changes are a mixed blessing. While their staple food has become expensive for poor consumers, farmers—who are amongst the poorest—are benefiting from the boom in export sales. Other countries are now investigating whether quinoa can be grown in different climates, and France and the US have become substantial producers. Figure 8.10b Quinoa producer prices. How can we explain the rapid increase in the price of quinoa? In this section, we look at the effects of changes in demand and supply in our simple examples of books and bread. At the end of this section you can apply the analysis to the real-world case of quinoa. 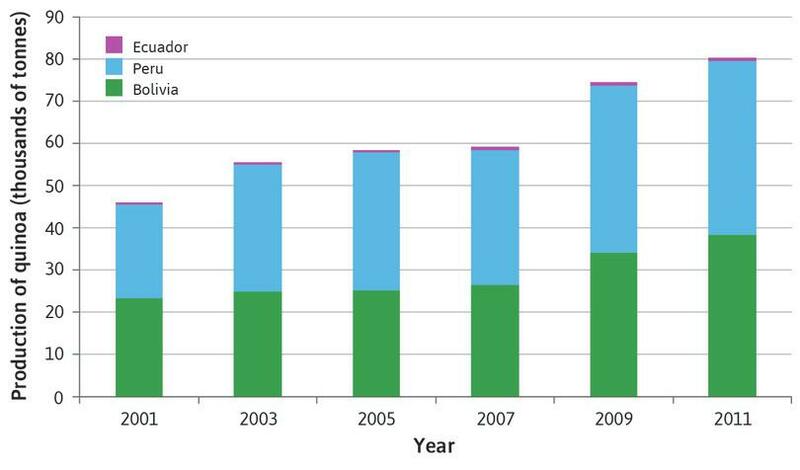 Global import demand for quinoa. Figure 8.10c Global import demand for quinoa. In the market for second-hand textbooks, demand comes from new students enrolling on the course, and supply comes from students who took the course in the previous year. In Figure 8.11 we have plotted supply and demand for textbooks when the number of students enrolling remains stable at 40 per year. The equilibrium price is $8 and 24 books are sold, as shown by point A. Suppose that in one year the course became more popular. Figure 8.11 shows what would happen. Figure 8.11 An increase in the demand for books. At the original levels of demand and supply, the equilibrium is at point A. The price is $8, and 24 books are sold. Figure 8.11a At the original levels of demand and supply, the equilibrium is at point A. The price is $8, and 24 books are sold. If there were more students enrolling in one year, there would be more students wanting to buy the book at each possible price. The demand curve shifts to the right. Figure 8.11b If there were more students enrolling in one year, there would be more students wanting to buy the book at each possible price. The demand curve shifts to the right. If the price remained at $8, there would be excess demand for books, that is, more buyers than sellers. Figure 8.11c If the price remained at $8, there would be excess demand for books, that is, more buyers than sellers. There is a new equilibrium at point B with a price of $10, at which 32 books are sold. The increase in demand has led to a rise in the equilibrium quantity and price. Figure 8.11d There is a new equilibrium at point B with a price of $10, at which 32 books are sold. The increase in demand has led to a rise in the equilibrium quantity and price. The increase in demand leads to a new equilibrium, in which 32 books are sold for $10 each. At the original price, there would be excess demand and sellers would want to raise their prices. At the new equilibrium, both price and quantity are higher. Some students who would not have sold their books at $8 will now sell at a higher price. Notice, however, that although demand has increased, not all the students who would have bought at $8 will purchase the book at the new equilibrium: those with WTP between $8 and $10 no longer want to buy. Demand is higher at each possible price, so the demand curve has shifted. In response to this shift there is a change in the price. This leads to an increase in the quantity supplied. This change is a movement along the supply curve. But the supply curve itself has not shifted (the number of sellers and their reserve prices have not changed), so we do not call this ‘an increase in supply’. After an increase in demand, the equilibrium quantity rises, but so does the price. You can see in Figure 8.11 that the steeper (more inelastic) the supply curve, the higher the price will rise and the lower the quantity will increase. If the supply curve is quite flat (elastic), then the price rise will be smaller and the quantity sold will be more responsive to the demand shock. In contrast, as an example of an increase in supply, think again about the market for bread in one city. 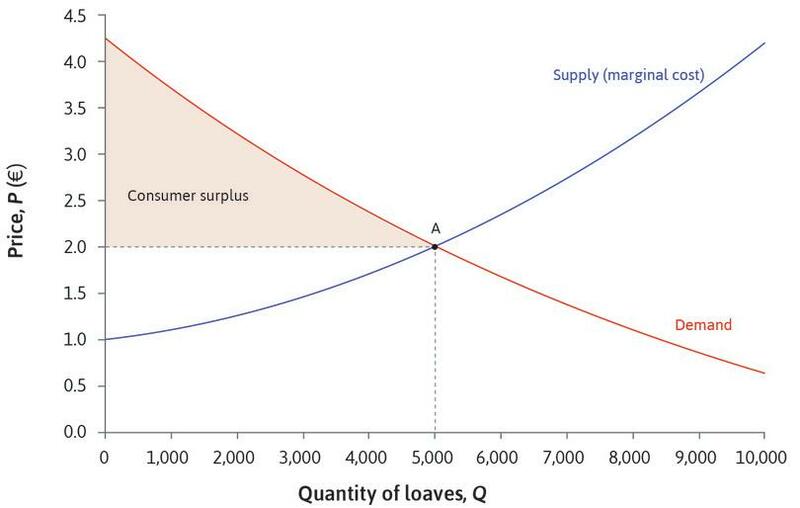 Remember that the supply curve represents the marginal cost of producing bread. Suppose that bakeries discover a new technique that allows each worker to make bread more quickly. This will lead to a fall in the marginal cost of a loaf at each level of output. In other words, the marginal cost curve of each bakery shifts down. Figure 8.12 shows the original supply and demand curves for the bakeries. 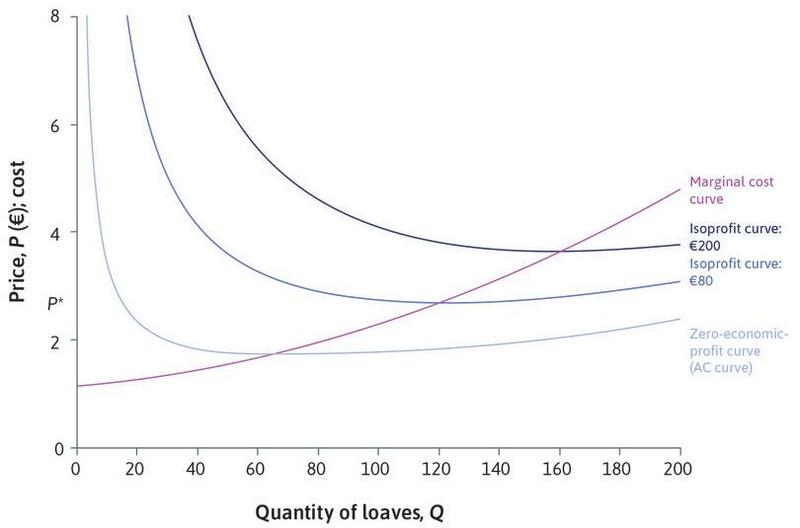 When the MC curve of each bakery shifts down, so does the market supply curve for bread. Look at Figure 8.12 to see what happens next. Figure 8.12 An increase in the supply of bread: A fall in MC. The city’s bakeries start out at point A, producing 5,000 loaves and selling them for €2 each. Figure 8.12a The city’s bakeries start out at point A, producing 5,000 loaves and selling them for €2 each. 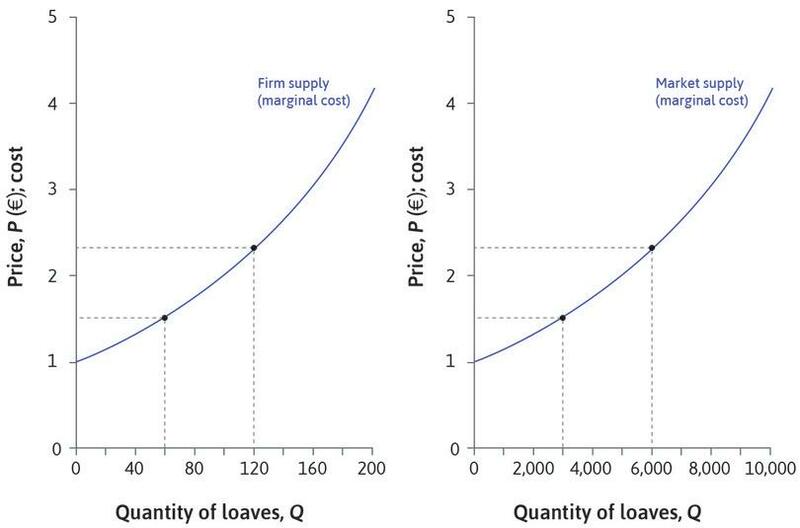 The market supply curve then shifts because of the fall in the bakeries’ marginal costs. 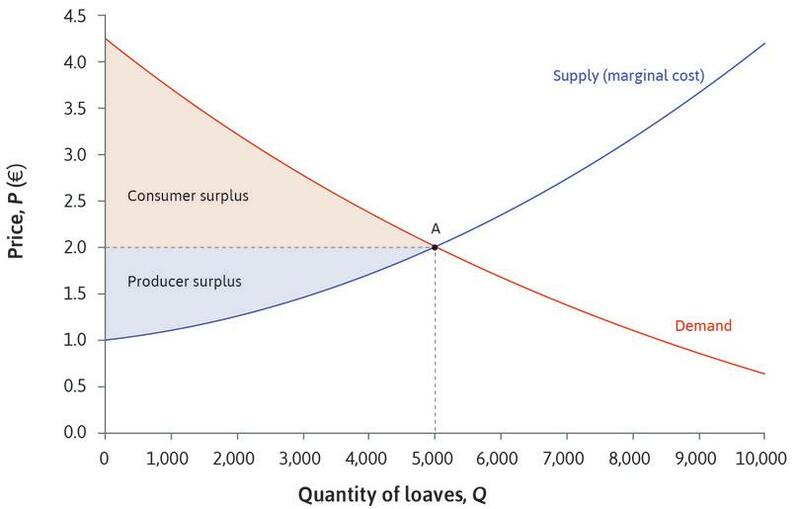 The supply curve shifts down, because at each level of output, the marginal cost and therefore the price at which they are willing to supply bread is lower. 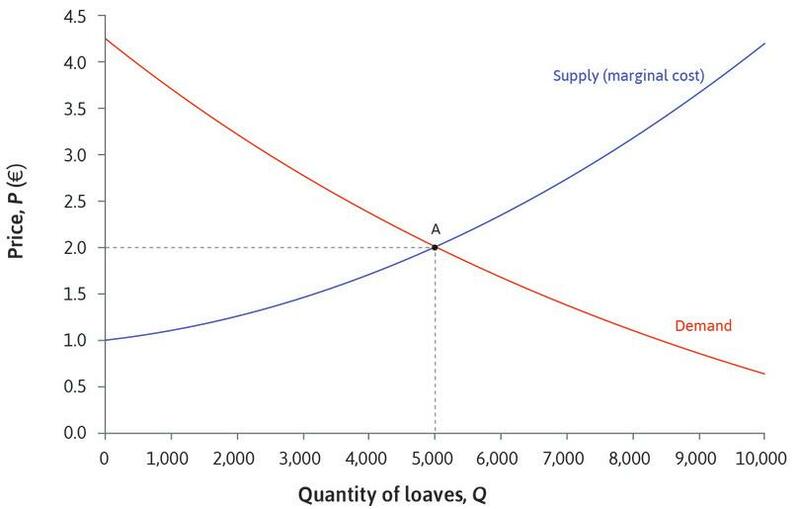 Figure 8.12b The market supply curve then shifts because of the fall in the bakeries’ marginal costs. The supply curve shifts down, because at each level of output, the marginal cost and therefore the price at which they are willing to supply bread is lower. The supply curve has shifted down. But another way to think of this change in supply is to say that the supply curve has shifted to the right. Since costs have fallen, the amount that bakeries will supply at each price is greater—an increase in supply. Figure 8.12c The supply curve has shifted down. But another way to think of this change in supply is to say that the supply curve has shifted to the right. Since costs have fallen, the amount that bakeries will supply at each price is greater—an increase in supply. The effect of the fall in marginal cost is an increase in market supply. At the original price, there is more bread than buyers want (excess supply). The bakeries would want to lower their prices. Figure 8.12d The effect of the fall in marginal cost is an increase in market supply. At the original price, there is more bread than buyers want (excess supply). The bakeries would want to lower their prices. The new market equilibrium is at point B, where more bread is sold and the price is lower. The demand curve has not shifted, but the fall in price has led to an increase in the quantity of bread demanded, along the demand curve. 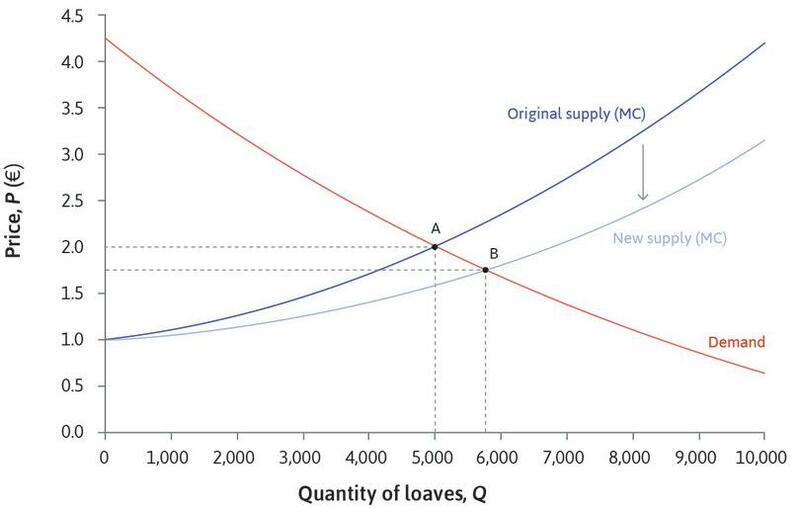 Figure 8.12e The new market equilibrium is at point B, where more bread is sold and the price is lower. The demand curve has not shifted, but the fall in price has led to an increase in the quantity of bread demanded, along the demand curve. As in the example of an increase in demand, an adjustment of prices is needed to bring the market into equilibrium. Such shifts in supply and demand are often referred to as shocks in economic analysis. We start by specifying an economic model and find the equilibrium. Then we look at how the equilibrium changes when something changes—the model receives a shock. The shock is called exogenous because our model doesn’t explain why it happened: the model shows the consequences, not the causes. Another reason for a change in market supply is the entry of more firms or the exit of existing firms. We analysed the equilibrium of the bread market in the case when there were 50 bakeries in the city. 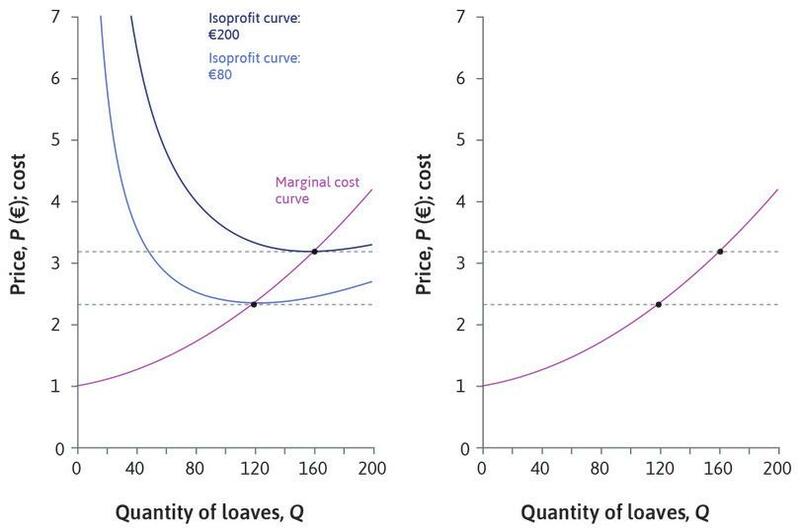 Remember from Section 8.4 that at the equilibrium price of €2, each bakery is on an isoprofit curve above the average cost curve. If economic profits are greater than zero, firms are receiving an economic rent, so other firms might want to invest in the baking business. Since there is an opportunity for making greater than normal profit by selling bread in the city, new bakeries may decide to enter the market. There will be some costs of entry, for example, acquiring and equipping the premises, but provided these are not too high (or if premises and equipment can be easily sold if the venture doesn’t work out) it will be worthwhile to do so. Remember that we find the market supply curve by adding up the amounts of bread supplied by each firm, at each price. When more bakeries have entered, more bread will be supplied at each price level. Although the reason for the supply increase is different from the previous one, the effect on the market equilibrium is the same: a fall in price and a rise in bread sales. Figure 8.13 shows the effects on equilibrium. The bakeries once again start off at point A, selling 5,000 loaves of bread for €2. The entry of new firms shifts the supply curve outwards. There is more bread for sale at each price, so at the original price there would be excess supply. The new equilibrium is at point B with a lower price and higher bread sales. An increase in the supply of bread: More firms enter. Figure 8.13 An increase in the supply of bread: More firms enter. The entry of new firms is unlikely to be welcomed by the existing bakeries. Their costs have not changed, but the market price has fallen to €1.75, so they must be making less profit than before. As we will see in Unit 11, the entry of new firms may eventually drive economic profits to zero, eliminating rents altogether. Consider again the market for quinoa. The changes shown in Figures 8.10a–c can be analysed as shifts in demand and supply. 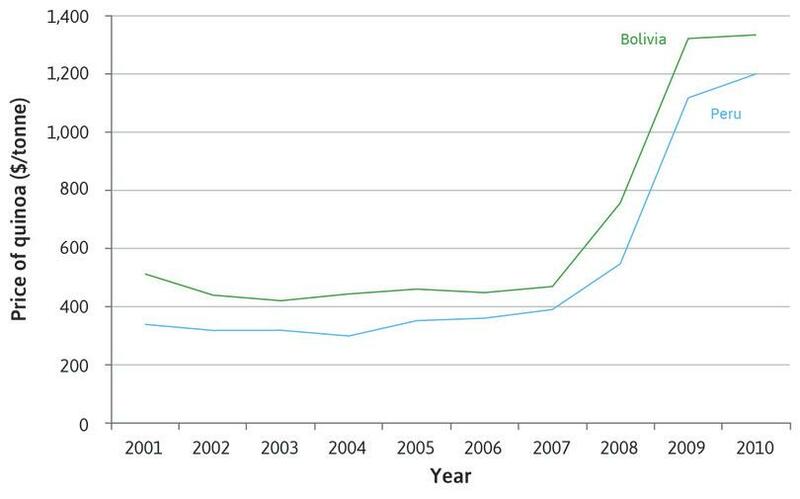 Suppose there was an unexpected increase in demand for quinoa in the early 2000s (a shift in the demand curve). What would you expect to happen to the price and quantity initially? Assuming that demand continued to rise over the next few years, how do you think farmers responded? Why did the price stay constant until 2007? How could you account for the rapid price rise in 2008 and 2009? Would you expect the price to fall eventually to its original level? The table shows the average and peak prices of wheat from 1838 to 1845, relative to silver. There are three groups of countries: those where violent revolutions took place, those where constitu­tional change took place without widespread violence, and those where no revolution occurred. Explain, using supply and demand curves, how a poor wheat harvest could lead to price rises and food shortages. Find a way to present the data to show that the size of the price shock, rather than the price level, is associated with the likelihood of revolution. Do you think this is a plausible explanation for the revolutions that occurred? A journalist suggests that similar factors played a part in the Arab Spring in 2010. Read the post. What do you think of this hypothesis? Berger, Helge, and Mark Spoerer. 2001. ‘Economic Crises and the European Revolutions of 1848.’ The Journal of Economic History 61 (2): pp. 293–326. Figure 8.8 shows the equilibrium of the bread market to be 5,000 loaves per day at price €2. A year later, we find that the market equilibrium price has fallen to €1.50. What can we conclude? The fall in the price must have been caused by a downward shift in the demand curve. The fall in the price must have been caused by a downward shift in the supply curve. The fall in price could have been caused by a shift in either curve. At a price of €1.50, there will be an excess demand for bread. This is not the only possible cause of a fall in price. A downward shift in either curve would cause the price to fall. If we knew whether output had increased or decreased, we could determine which curve had shifted. At the market equilibrium price, there is no excess demand or supply. A fall in the mortgage interest rate would shift up the demand curve for new houses. The launch of a new Sony smartphone would shift up the demand curve for existing iPhones. A fall in the oil price would shift up the demand curve for oil. A fall in the oil price would shift down the supply curve for plastics. If mortgage borrowing becomes cheaper, more people will want to buy houses at each house price. A launch of a substitute would decrease demand, shifting the demand curve down. The quantity of oil demanded would increase by moving along the demand curve; the curve itself would not move. The marginal cost of producing plastics would fall, so the supply curve would shift down. Governments can use taxation to raise revenue (to finance government spending, or redistribute resources) or to affect the allocation of goods and services in other ways, perhaps because the government considers a particular good to be harmful. The supply and demand model is a useful tool for analysing the effects of taxation. Raising revenue through taxation has a long history (see Unit 22). Take the taxation of salt, for example. For most of history, salt was used all over the world as a preservative, allowing food to be stored, transported, and traded. The ancient Chinese advocated taxing salt, since people needed it, however high the price. Salt taxes were an effective but often resented tool used by ruling elites in ancient India and medieval kings. Resentment of high salt taxes played an important part in the French Revolution, and Gandhi led protests against the salt tax imposed by the British in India. Figure 8.14 illustrates how a salt tax might work. 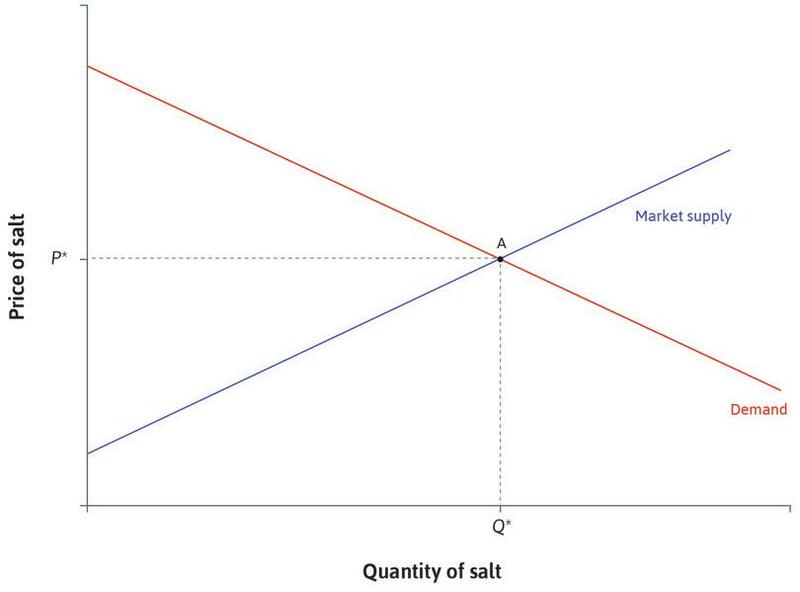 Initially the market equilibrium is at point A: the price is P* and the quantity of salt traded is Q*. Suppose that a sales tax of 30% is imposed on the price of salt, to be paid to the government by the suppliers. If suppliers have to pay a 30% tax, their marginal cost of supplying each unit of salt increases by 30%. So the supply curve shifts: the price is 30% higher at each quantity. The effect of a 30% salt tax. Figure 8.14 The effect of a 30% salt tax. Initially the market equilibrium is at point A. The price is P* and the quantity of salt sold is Q*. Figure 8.14a Initially the market equilibrium is at point A. The price is P* and the quantity of salt sold is Q*. A 30% tax is imposed on suppliers. Their marginal costs are effectively 30% higher at each quantity. The supply curve shifts. Figure 8.14b A 30% tax is imposed on suppliers. Their marginal costs are effectively 30% higher at each quantity. The supply curve shifts. The new equilibrium is at B. The price paid by consumers has risen to P1 and the quantity has fallen to Q1. Figure 8.14c The new equilibrium is at B. The price paid by consumers has risen to P1 and the quantity has fallen to Q1. The price received by suppliers (after they have paid the tax) is P0. The double-headed arrow shows the tax paid to the government on each unit of salt sold. Figure 8.14d The price received by suppliers (after they have paid the tax) is P0. 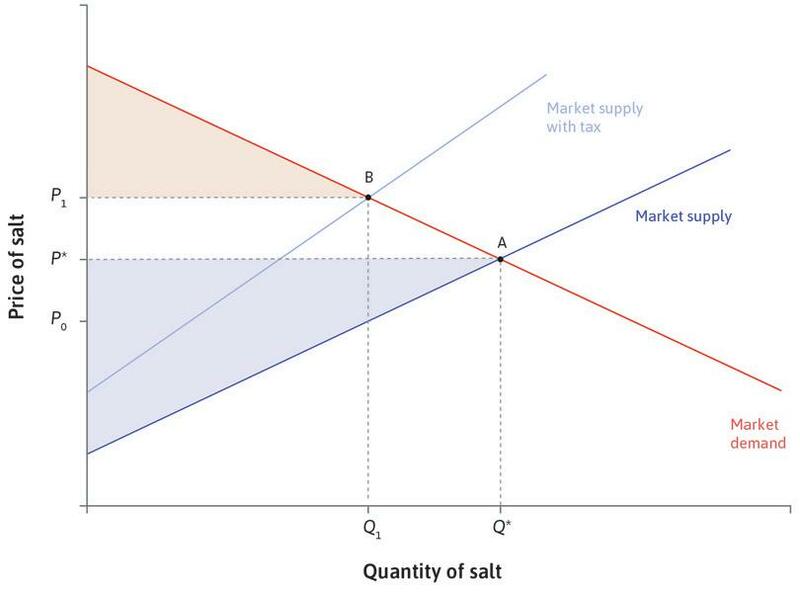 The double-headed arrow shows the tax paid to the government on each unit of salt sold. The new equilibrium is at point B, where a lower quantity of salt is traded. Although the consumer price has risen, note that it is not 30% higher than before. The price paid by consumers, P1, is 30% higher than the price received by the suppliers (net of the tax), which is P0. Suppliers receive a lower price than before, they produce less, and their profits will be lower. This illustrates an important feature of taxes: it is not necessarily the taxpayer who feels its main effect. In this case, although the suppliers pay the tax, the tax incidence falls partly on consumers and partly on producers. Consumer surplus falls: Consumers pay a higher price, and buy less salt. Producer surplus falls: They produce less and receive a lower net price. Total surplus is lower: Even taking account of the tax revenue received by the government, the tax causes a deadweight loss. Figure 8.15 Taxation and deadweight loss. Before the tax is imposed, the equilibrium allocation at A maximizes the gains from trade. In the upper panel the red triangle is the consumer surplus and the blue triangle is the producer surplus. Figure 8.15a Before the tax is imposed, the equilibrium allocation at A maximizes the gains from trade. In the upper panel the red triangle is the consumer surplus and the blue triangle is the producer surplus. The tax reduces the quantity traded to Q1, and raises the consumer price from P* to P1. The consumer surplus falls. Figure 8.15b The tax reduces the quantity traded to Q1, and raises the consumer price from P* to P1. The consumer surplus falls. The suppliers sell a lower quantity, and the price they receive falls from P* to P0. The producer surplus falls. Figure 8.15c The suppliers sell a lower quantity, and the price they receive falls from P* to P0. The producer surplus falls. A tax equal to (P1 – P0) is paid on each of the Q1 units of salt that are sold. The green rectangular area is the total tax revenue. There is a deadweight loss equal to the area of the white triangle. 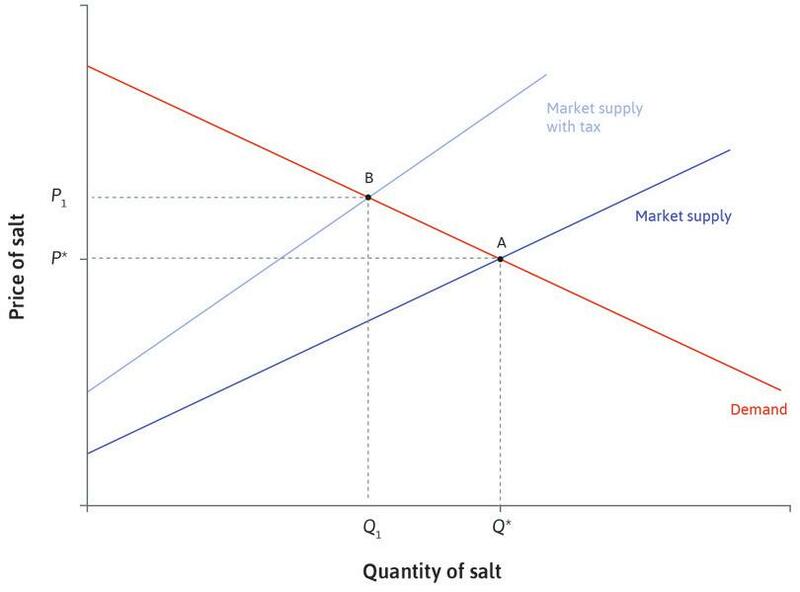 Figure 8.15d A tax equal to (P1 – P0) is paid on each of the Q1 units of salt that are sold. The green rectangular area is the total tax revenue. There is a deadweight loss equal to the area of the white triangle. Since the quantity of salt traded is no longer at the level that maximizes gains from trade, the tax has led to a deadweight loss. In general, taxes change prices, and prices change buyers’ and sellers’ decisions, which can cause deadweight loss. To raise as much revenue as possible, the government would prefer to tax a good for which demand is not very responsive to price, so that the fall in quantity traded is quite small—that is to say, a good with a low elasticity of demand. That is why the ancient Chinese recommended taxing salt. The government spends the revenue on goods and services that enhance the wellbeing of the population: Then the tax and resulting expenditure may enhance public welfare—even though it reduces the surplus in the particular market that is taxed. The government spends the revenues on an activity that does not contribute to wellbeing: Then the lost consumer surplus is just a reduction in the living standards of the population. Therefore, taxes can improve or reduce overall welfare. The most that we can say is that taxing a good whose demand is inelastic is an efficient way to transfer the surplus from consumers to the government. The government’s power to levy taxes is a bit like the price-setting power of a firm that sells a differentiated good. It uses its power to raise the price and collect revenue, while reducing the quantity sold. Its ability to levy taxes depends on the institutions it can use to enforce and collect them. One reason for the use of salt taxes in earlier times was that it was relatively easy for a powerful ruler to take full control of salt production, in some cases as a monopolist. In the notorious case of the French salt tax, the monarchy not only controlled all salt production; it also forced its subjects to buy up to 7 kg of salt each per year. In March and April 1930, the artificially high price of salt in British colonial India provoked one of the defining moments of the Indian independence movement: Mahatma Gandhi’s salt march to acquire salt from the Indian ocean. Similarly, in what came to be called the Boston tea party, in 1773 American colonists objecting to a British colonial tax on tea dumped a cargo of tea into the Boston harbour. Resistance to taxes on inelastic goods arises for the very reason they are imposed: they are difficult to escape! In many modern economies the institutions for tax collection are well-established, usually with democratic consent. Provided that citizens believe taxes have been implemented fairly, using them to raise revenue is accepted as a necessary part of social and economic policy. We will now look at another reason why governments may decide to levy taxes. The level of the Danish tax was 16 Danish kroner (kr) per kilogram of saturated fat, corresponding to 10.4 kr per kg of butter. Note that this was a specific tax, levied as a fixed amount per unit of butter. A tax like the one we analysed for salt, levied as a percentage of the price, is known as an ad valorem tax. According to a study of the Danish fat tax, it corresponded to about 22% of the average butter price in the year before the tax. The study found that it reduced the consumption of butter and related products (butter blends, margarine, and oil) by between 15% and 20%. We can illustrate the effects in the same way as we did for the salt tax, using the supply and demand model (we are assuming here that butter retailers are price-takers). 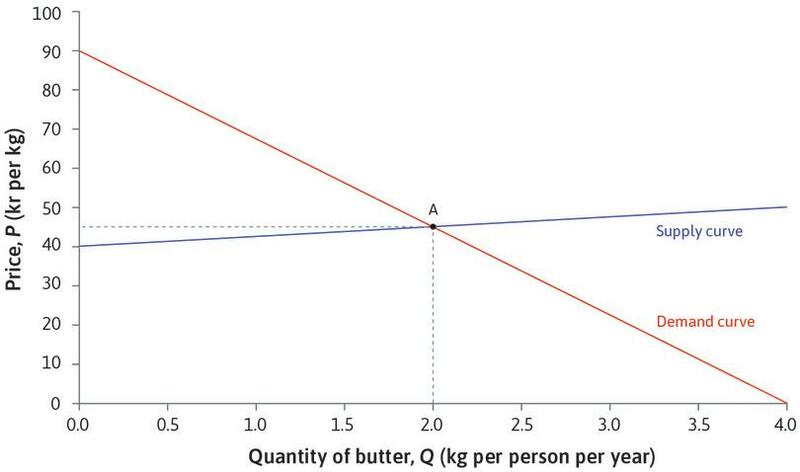 Figure 8.16 shows a demand curve for butter, measured in kilograms per person per year. The numbers correspond approximately to Denmark’s experience. We have drawn the supply curve for butter as almost flat, on the assumption that the marginal cost of butter for retailers does not change very much as quantity varies. The initial equilibrium is at point A, where the price of butter is 45 kr per kg, and each person consumes 2 kg of butter per year. The effect of a fat tax on the retail market for butter. Figure 8.16 The effect of a fat tax on the retail market for butter. Initially the market for butter is in equilibrium. The price of butter is 45 kr per kg, and consumption of butter in Denmark is 2 kg per person per year. Figure 8.16a Initially the market for butter is in equilibrium. The price of butter is 45 kr per kg, and consumption of butter in Denmark is 2 kg per person per year. A tax of 10 kr per kg levied on suppliers raises their marginal costs by 10 kr at every quantity. The supply curve shifts upwards by 10 kr. Figure 8.16b A tax of 10 kr per kg levied on suppliers raises their marginal costs by 10 kr at every quantity. The supply curve shifts upwards by 10 kr. The new equilibrium is at point B. The price has risen to 54 kr. Each person’s annual consumption of butter has fallen to 1.6 kg. Figure 8.16c The new equilibrium is at point B. The price has risen to 54 kr. Each person’s annual consumption of butter has fallen to 1.6 kg. A tax of 10 kr per kg shifts the supply curve upwards and leads to a rise in price to 54 kr, and a fall in consumption to 1.6 kg. The consumer price rises by 9 kr—almost the full amount of the tax—and the suppliers’ net revenue per kg of butter falls to 44 kr. In this case, although suppliers pay the tax, the tax incidence is felt mainly by consumers. Of the 10 kr tax per kg, the consumer effectively pays 9 kr, while the supplier or producer pays 1 kr. So the price received by the retailers, net of tax, is only 1 kr lower. Figure 8.17 shows what happens to consumer and producer surplus as a result of the fat tax. The effect of a fat tax on the consumer and producer surplus for butter. 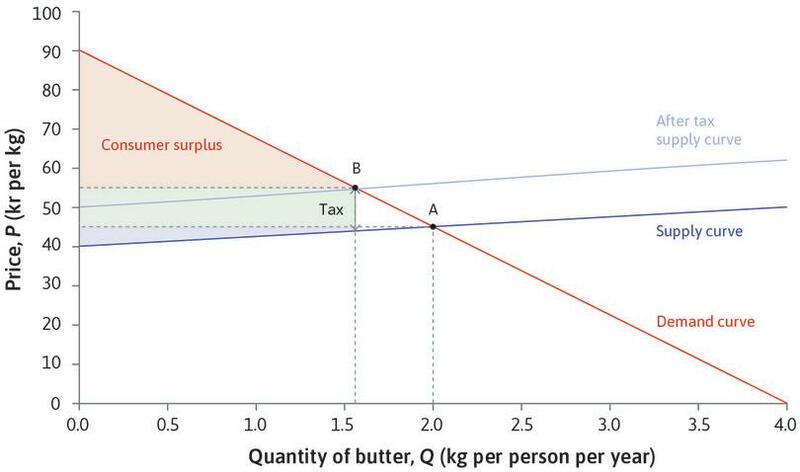 Figure 8.17 The effect of a fat tax on the consumer and producer surplus for butter. Again, both consumer and producer surpluses fall. The area of the green rectangle represents the tax revenue: with a tax of 10 kr per kg and equilibrium sales of 1.6 kg per person, tax revenue is 10 × 1.6 = 16 kr per person per year. Consumption of butter products fell: In this case by 20%. You can see this in Figure 8.16. In this respect, the policy was successful. There was a large fall in surplus, especially consumer surplus: You can see this in Figure 8.17. But recall that the government’s aim when it implemented the fat tax policy was not to raise revenue, but rather to reduce quantity. So the fall in consumer surplus was inevitable. The loss of surplus caused by a tax is a deadweight loss, which sounds negative. But in this case the policymaker might see it as a gain if the ‘good’, butter, is considered ‘bad’ for consumers. One aspect of taxation not illustrated in our supply and demand analysis is the cost of collecting it. Although the Danish fat tax successfully reduced fat consumption, the government abolished it after only 15 months because of the administrative burden it placed on firms. Any taxation system requires effective mechanisms for tax collection, and designing taxes that are simple to administer (and difficult to avoid) is an important goal of tax policy. Policymakers who want to introduce food taxes will need to find ways of minimizing administrative costs. But since the costs cannot be eliminated, they will also need to consider whether the health gain (and reduction of costs of bad health) will be sufficient to offset them. Food taxes such as the ones discussed here and in Unit 7 are often intended to shift consumption towards a healthier diet, but give rise to deadweight loss. Why do you think a policymaker and a consumer might interpret this deadweight loss differently? Figure 8.14 shows the demand and supply curves for salt, and the shift in the supply curve due to the implementation of a 30% tax on the price of salt. Which of the following statements are correct? In the post-tax equilibrium, the consumers pay P₁ and the producers receive P*. The government’s tax revenue is given by (P* – P0)Q1. The deadweight loss is given by (1/2)(P1 – P0)(Q* – Q1). As a result of the tax, the consumer surplus is reduced by (1/2)(Q1 + Q*)(P1 – P*). In the post-tax equilibrium, the consumers pay P₁ and the producers receive P0. The government’s tax revenue is (P1 – P0) × Q1. This is the area of the triangle between the supply and demand curves, below AB. This is the area of the trapezium between the horizontal dotted lines through A and B. Figure 8.17 shows the effect of a tax intended to reduce the consumption of butter. The before-tax equilibrium is at A = (2.0 kg, 45 kr) and the after-tax equilibrium is at B = (1.6 kg, 54 kr). The tax imposed is 10 kr per kg of butter. Which of the following statements is correct? The producers receive 45 kr per kg of butter. The tax policy would be more effective if the supply curve were less elastic. The very elastic supply curve implies that the incidence of the tax falls mainly on consumers. The loss of consumer surplus due to tax is (1/2) × 10 × (2.0 – 1.6) = 2.0. The producers receive the price 54 – 10 = 44 kr per kg. If the supply curve were less elastic, the policy would be less effective—butter consumption would not fall as much. The elastic supply curve means that the price paid by consumers changes much more than the price received by producers. The calculation gives the deadweight loss, not the loss of consumer surplus. The good or service being exchanged is homogeneous (it does not differ from one seller to another). There are large numbers of potential buyers and sellers of the good, each acting independently of the others. Buyers and sellers can readily know the prices at which other buyers and sellers are exchanging the good. Many undifferentiated sellers: As Marshall discussed, there must be many sellers, all selling identical goods. If their goods were differentiated, then each one would have some market power. Sellers must act independently: If they act as a cartel, for example, they are not price-takers—they can jointly choose the price. Many buyers all wanting to buy the good: Each of them will choose whichever seller has the lowest price. Buyers know the sellers’ prices: If they do not, they cannot choose the lowest one. There must be many buyers, competing with each other: Then sellers have no reason to sell to someone who would pay less than everyone else. All transactions take place at a single price: This is known as the law of one price. At that price, the amount supplied equals the amount demanded: the market clears. No buyer or seller can benefit by altering the price they are demanding or offering. They are all price-takers. All potential gains from trade are realized. 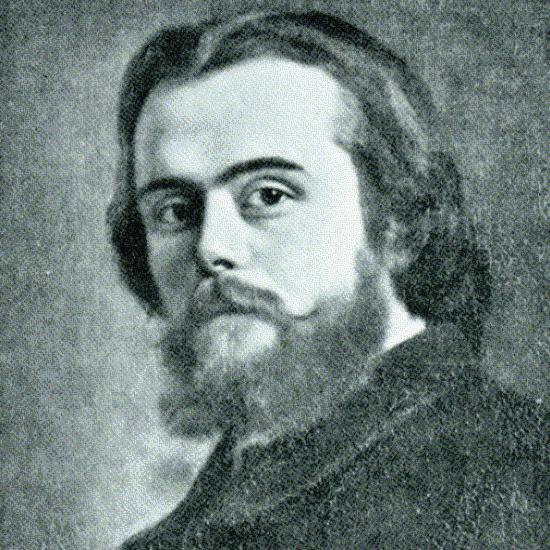 Léon Walras, a ninteenth-century French economist, built a mathematical model of an economy in which all buyers and sellers are price-takers, which has been influential in how many economists think about markets. Léon Walras (1834–1910) was a founder of the neoclassical school of economics. He was an indifferent student, and twice failed the entrance exam to the École Polytechnique in Paris, one of the most prestigious universities in his native France. He studied engineering at the School of Mines instead. Eventually his father, an economist, convinced him to take up the challenge of making economics into a science. Walras represented basic economic relationships as equations, which he used to study the workings of an entire economy composed of many interlinked markets. Prior to Walras, most economists had considered these markets in isolation: they would have studied, for example, how the price of textiles is determined on the cloth market, or land rents on the land market. A century before Walras, a group of French economists called the physiocrats had studied the circulation of goods throughout the economy, as if the flow of goods from one sector to another in the economy was comparable to the circulation of blood in the human body (one of the leading physiocrats was a medical doctor). But the physiocrats’ model was little more than a metaphor that drew attention to the interconnectedness of markets. Walras used mathematics, rather than medical analogies, to create what is now called general equilibrium theory, a mathematical model of an entire economy in which all buyers and sellers act as price-takers and supply equals demand in all markets. Walras’ work was the basis of the proof, much later, of the invisible hand theorem, giving the conditions under which such an equilibrium is Pareto efficient. The invisible hand game in Unit 4 is an example of the conditions in which the pursuit of self-interest can benefit everyone. Walras had defended the right to private property, but to help the working poor he also advocated the nationalization of land and the elimination of taxes on wages. Seven years after his death, the general equilibrium model was to play an important role in the debate about the feasibility and desirability of centralized economic planning compared to a market economy. In 1917, the Bolshevik Revolution in Russia put the economics of socialism and central planning on the agenda of many economists, but surprisingly, it was the defenders of central planning, not the advocates of the market, who used Walras’ insights to make their points. Friedrich Hayek, and other defenders of capitalism, criticized the Walrasian general equilibrium model. Their argument: by deliberately ignoring the fact that a capitalist economy is constantly changing, and therefore not taking into account the contribution of entrepreneurship and creativity in market competition, Walras had missed the true virtues of the market. The model of perfect competition describes an idealized market structure in which we can be confident that the assumption of price-taking that underlies our model of supply and demand will hold. 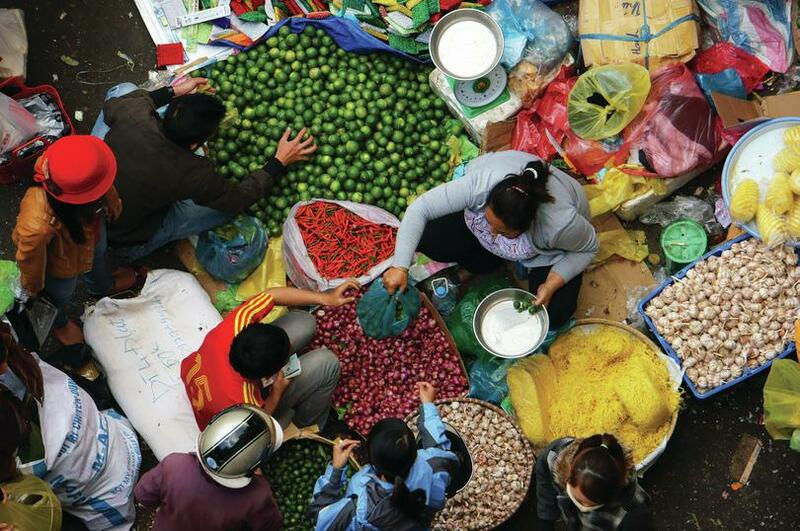 Markets for agricultural products such as wheat, rice, coffee, or tomatoes look rather like this, although goods are not truly identical, and it is unlikely that everyone is aware of all the prices at which trade takes place. But it is nevertheless clear that they have very little, if any, power to affect the price at which they trade. In other cases—for example, markets where there are some differences in the quality of goods—there may still be enough competition that we can assume price-taking, in order to obtain a simple model of how the market works. A simplified model can provide useful predictions when the assumptions underlying it are only approximately true. Judging whether or not it is appropriate to draw conclusions about the real world from a simplified model is an important skill of economic analysis. For example, we know that markets are not perfectly competitive when products are differentiated. Consumers’ preferences differ, and we saw in Unit 7 that firms have an incentive to differentiate their product, if they can, rather than to supply a product similar or identical to others. Nevertheless, the model of supply and demand can be a useful approximation to help us to understand how some markets for non-identical products behave. Figure 8.18 shows the market for an imaginary product called Choccos, for which there are close substitutes, as many similar products compete in the wider market for chocolate bars. Due to competition from other chocolate bars, the demand curve is almost flat. The range of feasible prices for Choccos is narrow, and the firm chooses a price and quantity where the marginal cost is close to the price. So this firm is in a similar situation to a firm in a perfectly competitive market. It is the equilibrium price in the larger market for chocolate bars that determines the feasible prices for Choccos—they have to be sold at a similar price to other chocolate bars. The market for Choccos and chocolate bars. Figure 8.18 The market for Choccos and chocolate bars. The left hand panel shows the market for Choccos, produced by one firm. There are many close substitutes in the wider market for chocolate bars. Figure 8.18a The left hand panel shows the market for Choccos, produced by one firm. There are many close substitutes in the wider market for chocolate bars. Due to competition from similar chocolate bars, the demand curve for Choccos is almost flat. The range of feasible prices is narrow. Figure 8.18b Due to competition from similar chocolate bars, the demand curve for Choccos is almost flat. The range of feasible prices is narrow. The firm chooses a price P* similar to its competitors, and a quantity where MC is close to P*. Whatever the price of its competitors, it would produce close to its marginal cost curve. So the firm’s MC curve is approximately its supply curve. Figure 8.18c The firm chooses a price P* similar to its competitors, and a quantity where MC is close to P*. Whatever the price of its competitors, it would produce close to its marginal cost curve. So the firm’s MC curve is approximately its supply curve. 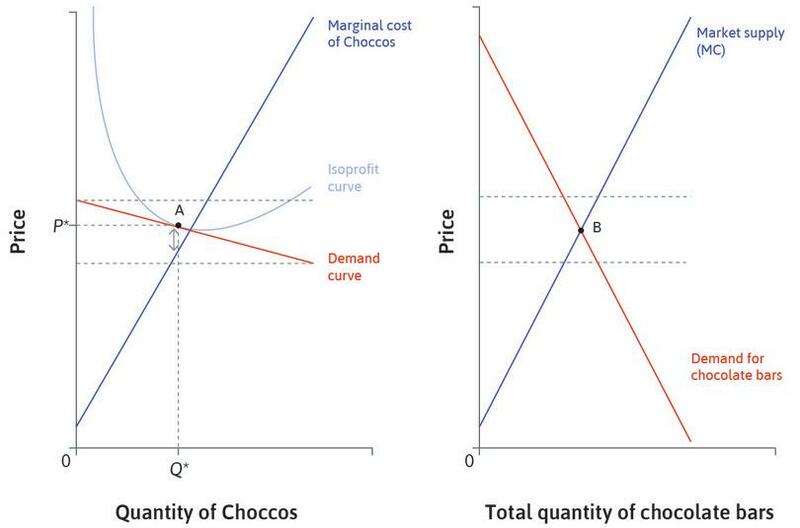 We can construct the market supply curve for chocolate bars in the right hand panel by adding the quantities from the marginal cost curves of all the chocolate bar producers. 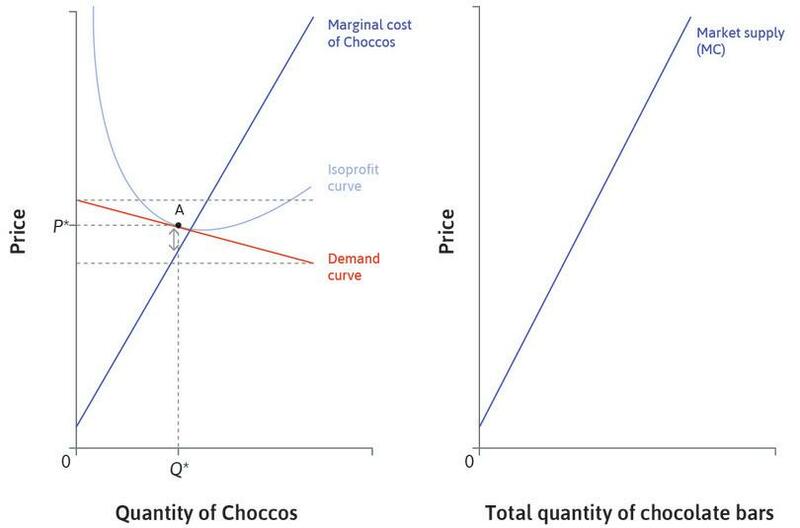 Figure 8.18d We can construct the market supply curve for chocolate bars in the right hand panel by adding the quantities from the marginal cost curves of all the chocolate bar producers. If most consumers do not have strong preferences for one firm’s product, we can draw a market demand curve for chocolate bars. Figure 8.18e If most consumers do not have strong preferences for one firm’s product, we can draw a market demand curve for chocolate bars. The equilibrium price in the chocolate bar market (right-hand panel) determines the narrow range of prices from which the Chocco firm can choose (left-hand panel)—it will have to set a price quite close to that of other chocolate bars. 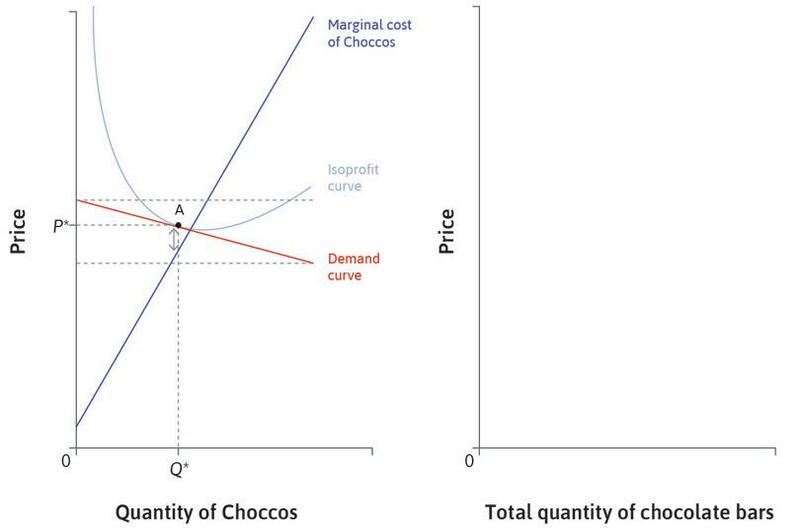 Figure 8.18f The equilibrium price in the chocolate bar market (right-hand panel) determines the narrow range of prices from which the Chocco firm can choose (left-hand panel)—it will have to set a price quite close to that of other chocolate bars. The narrow range of feasible prices for this firm is determined by the behaviour of its competitors. So the main influence on the price of Choccos is not the firm, but the market for chocolate bars as a whole. Since all the firms will be producing at similar prices, which will be close to their marginal costs, we lose little by ignoring the differences between them and assuming that each firm’s supply curve is its marginal cost curve, then finding the equilibrium in the wider market for chocolate bars. We have already taken this approach when we analysed the Danish butter market. In practice, it is likely that some retailers who sell butter have some power to set prices. A local shop may be able to set a price that is higher than the price of butter elsewhere, knowing that some shoppers will find it convenient to buy rather than searching for a lower price. However, it is reasonable to assume that they don’t have much wiggle room to set prices, and are strongly influenced by the prevailing market price. So price-taking is a good approximation for this market—good enough, at least, that the supply and demand model can help us to understand the impact of a fat tax. In what ways does the market for chocolate bars fail to satisfy the conditions for perfect competition? Each brand of chocolate bar faces competition from many other similar brands. Why, despite this, do some producers have considerable market power? In what market conditions do you think price-fixing is most likely to occur, and why? Look again at Figure 8.18, which shows the market for Choccos and for all chocolate bars. Based on the two diagrams, which of the following statements is correct? The firm that makes Choccos chooses to produce at the bottom of the U-shaped isoprofit curve. All chocolate bars will be sold at the same price P*. The existence of many competitors means that the firm is a price-taker. The market marginal cost (MC) curve is approximately the sum of the MC curves of all the producers of the chocolate bars. The firm chooses to produce where the isoprofit curve is tangent to the firm’s demand curve. As the demand curve is not quite horizontal, this point will be close to, but not at, the bottom of the U-shape. The chocolate bars are not perfect substitutes. They will be sold at similar but not exactly the same prices. The left-hand diagram shows that the firm has a downward-sloping demand curve, so it can choose from a narrow range of prices. Each firm produces close to its MC curve, so the MC curve is approximately the firm’s supply curve, and so market supply is approximately the sum of the firms’ MC curves. Do all trades take place at the same price? Are firms selling goods at a price equal to marginal cost? The difficulty with the second test is that it is often difficult to measure marginal cost. But Lawrence Ausubel, an economist, was able to do this for the US bank credit card market in the 1980s. At this time 4,000 banks were selling an identical product: credit card loans. The cards were mostly Visa or Mastercard, but the individual banks decided the price of their loans—that is, the interest rate. The banks’ cost of funds—the opportunity cost of the money loaned to credit card holders—could be deduced from other interest rates in financial markets. Although there were other components of marginal cost, the cost of funds was the only one that varied substantially over time. So if the credit card market were competitive, we would expect to see the interest rate on credit card loans rise and fall with the cost of funds. It may be difficult for consumers to change credit card provider: In that case, the banks are not forced to compete with each other, so they keep prices high when costs fall. Banks might not be able to decide which of their customers are bad risks: That would be a problem in this market, because the bad risks are most sensitive to prices. The banks do not want to lower their prices for fear of attracting the wrong kind of customer. Perfect competition requires that consumers are sufficiently sensitive to prices to force firms to compete, and this may not be the case in any market where consumers have to search for products. If it takes time and effort to check prices and inspect products, they may decide to buy as soon as they find something suitable, rather than continue the search for the cheapest. When the Internet made online shopping feasible, many economists hypothesized that this would make retail markets more competitive: consumers would easily be able to check the prices of many suppliers before deciding to buy. But often consumers are not very sensitive to prices, even in this environment.10 You can test the law of one price in online retail competition for yourself, by checking the prices of a particular product that should be the same wherever you buy it—a book or household appliance, for example—and comparing them. Figure 8.19 shows the prices of UK online retailers for a particular DVD in March 2014. The range of prices is high: the most expensive seller is charging 66% more than the cheapest. Differing prices for the same DVD, from UK online retailers (March 2014). Figure 8.19 Differing prices for the same DVD, from UK online retailers (March 2014). From the early nineteenth century, the catches of Atlantic fisherman landed in the port of New York were sold at the Fulton Fish Market in Manhattan (in 2005, it relocated to the Bronx) to restaurants and retailers. It is still the largest market for fresh fish in the US, although fish are now brought in by road or air. Dealers do not display prices. Instead, customers can inspect the fish and ask for a price before making their decision, making it an institution that appears to encourage competition. Of course, prices were not the same for every transaction: quality varied, and fish supplies changed from day to day. But her surprising observation was that on average Asian buyers paid about 7% less per pound than white buyers (all of the dealers were white). There seemed to be no differences between the transactions with white and Asian buyers that could explain the different prices. How could this happen? If one dealer was setting high prices for white buyers, why did other dealers not try to attract them to their own stalls by offering a better deal? 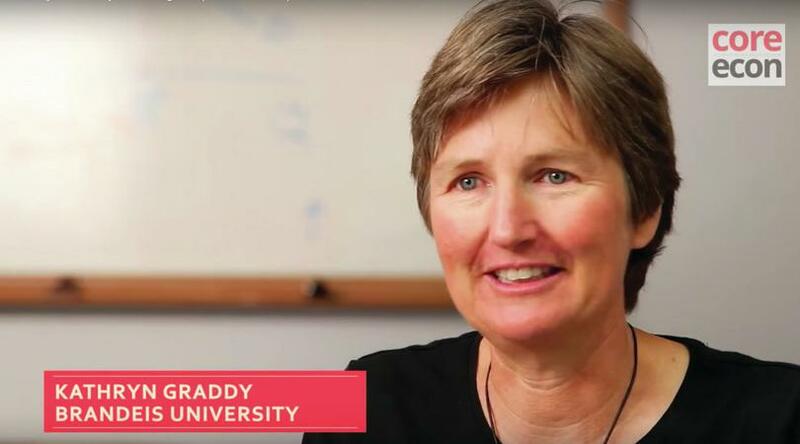 Watch our interview with Graddy to find out how she collected her data, and what she discovered about the model of perfect competition. In theory, the easy access to price information across the market should have allowed all buyers to quickly find very similar prices. But in practice, Graddy observed that bargaining occurred rarely, and then only with buyers of large quantities. Graddy observed that dealers knew that, in practice, white buyers were willing to take higher prices than Asian buyers. The dealers knew this without having to collude in setting their prices. The examples in this section show that it is hard to find evidence of perfect competition. Nevertheless, we have seen that the model can be a useful approximation. Even if the conditions for perfect competition are not all satisfied, the model of supply and demand is a valuable tool for economic analysis, applicable when there is enough competition that individuals have little influence on prices. Choose any published textbook that you have been using in your course. Go on to the web and find the price you can buy this book for from a number of different suppliers (Amazon, eBay, your local bookstore, and so on). Is there dispersion in prices, and if so, how can you explain it? How does she explain her evidence that the law of one price did not hold in the fish market? Why did buyers and sellers not look for better deals? Why did new dealers not enter the market in pursuit of economic rents? We now have two different models of how firms behave. In the Unit 7 model, the firm produces a product that is different from the products of other firms, giving it market power—the power to set its own price. This model applies to the extreme case of a monopolist, who has no competitors at all, such as water supply companies, and national airlines with exclusive rights granted by the government to operate domestic flights. The Unit 7 model also applies to a firm producing differentiated products such as breakfast cereals, cars, or chocolate bars—similar, but not identical, to those of its competitors. In such cases, the firm still has the power to set its own price. But if it has close competitors, demand will be quite elastic and the range of feasible prices will be narrow. In the supply-and-demand model developed in this unit, firms are price-takers. Competition from other firms producing identical products means that they have no power to set their own prices. This model can be useful as an approximate description of a market in which there are many firms selling very similar products, even if the idealized conditions for a perfectly competitive market do not hold. In practice, economies are a mixture of more and less competitive markets. In some respects, firms act the same whether they are the single seller of a good or one of a great many competitors: all firms decide how much to produce, which technologies to use, how many people to hire, and how much to pay them so as to maximize their profits. But there are important differences. Look back at the decisions made by price-setting firms to maximize profits (Figure 7.2). Firms in more competitive markets lack either the incentive or the opportunity to do some of these things. A firm with a unique product will advertise (Buy Nike!) to shift the demand curve for its product to the right. But why would a single competitive firm advertise (Drink milk!)? This would shift the demand curve for all of the firms in the industry. Advertising in a competitive market is a public good: the benefits go to all of the firms in the industry. If you see a message like ‘Drink milk!’ it is probably paid for by an association of dairies, not by a particular one. The same is true of expenditures to influence public policy. If a large firm with market power is successful, for example, in relaxing environmental regulations, then it will benefit directly. But activities like lobbying or contri­buting money to electoral campaigns will be unattractive to the competitive firm because the result (a more profit-friendly policy) is a public good. Similarly, investment in developing new technologies is likely to be undertaken by firms facing little competition, because if they are successful in finding a profitable innovation, the benefits will not be lost to competitors also adopting it. However, one way that successful large firms can emerge is by breaking away from the competition and innovating with a new product. The UK’s largest organic dairy, Yeo Valley, was once an ordinary farm selling milk, just like thousands of others. In 1994 it established an organic brand, creating new products for which it could charge premium prices. With the help of imaginative marketing campaigns it has grown into a company with 1,800 employees and 65% of the UK organic market. The table in Figure 8.20 summarizes the differences between price-setting and price-taking firms. Figure 8.20 Price-setting and price-taking firms. Buyers or sellers who have little influence on market prices, due to competition, are called price-takers. A market is in competitive equilibrium if all buyers and sellers are price-takers, and at the prevailing market price, the quantity supplied is equal to the quantity demanded (the market clears). Price-taking firms choose their quantity so that the marginal cost is equal to the market price. The equilibrium allocation exploits all possible gains from trade. The model of perfect competition describes a set of idealized market conditions in which we would expect a competitive equilibrium to occur. Markets for real goods don’t conform exactly to the model. But price-taking can be a useful approximation, enabling us to use supply and demand curves as a tool for understanding market outcomes, for example, the effects of a tax, or a demand shock. Marshall, Alfred. 1920. Principles of Economics, 8th ed. London: MacMillan & Co.
Reyes, Jose Daniel, and Julia Oliver. 2013. ‘Quinoa: The Little Cereal That Could’. The Trade Post. 22 November 2013. Stucke, Maurice. 2013. ‘Is Competition Always Good?’. OUPblog. Updated 25 March 2013. The Economist. 2001. ‘Is Santa a Deadweight Loss?’. Updated 20 December 2001. Waldfogel, Joel. 1993. ‘The Deadweight Loss of Christmas’. American Economic Review 83 (5). Walras, Leon. (1874) 2014. Elements of Theoretical Economics: Or the Theory of Social Wealth. Cambridge: Cambridge University Press.